Welcome to year six, covering September 2008 to 2009. This was Anna’s final year at Tutor Time leading up to her first day of 1st grade at Lawton. This was taken on October 29, 2008 at a Tutor Time Halloween party. 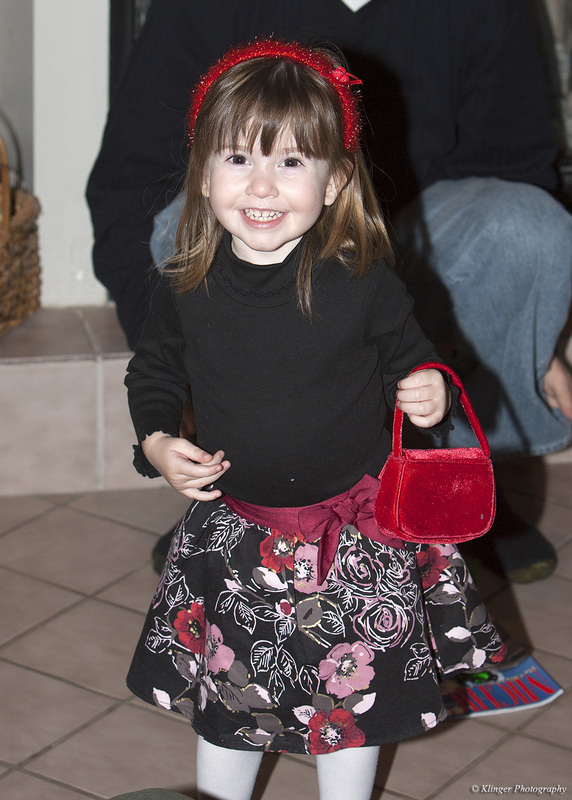 Anna loved, and still loves, dressing up for Halloween. 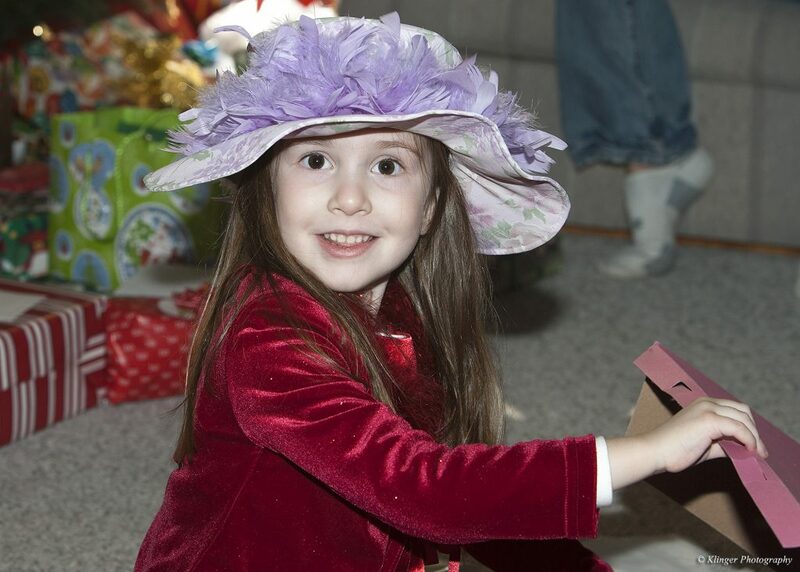 Here she is opening presents at Grandpa Snazzy’s and Grandma Robbie’s house on Christmas Day, 2008. This was taken during our one (and only) trip to Disney World. 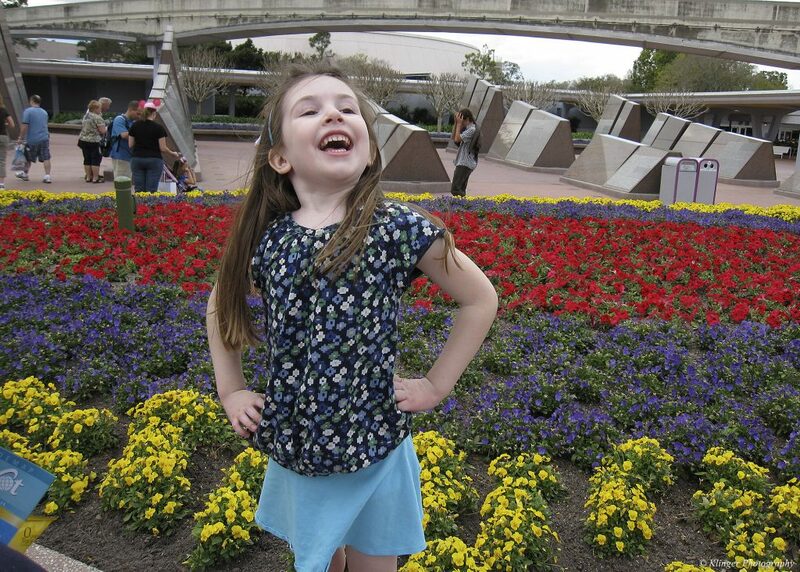 She is giving us a nice super-hero pose in front of the Epcot “giant ball”. I have always loved this picture and was one of my favorites from that trip. As a side note, this was taken with a small point-and-shoot camera as I didn’t bring my DSLR on that trip. It goes to show, that the best camera in the world is the one you have with you! 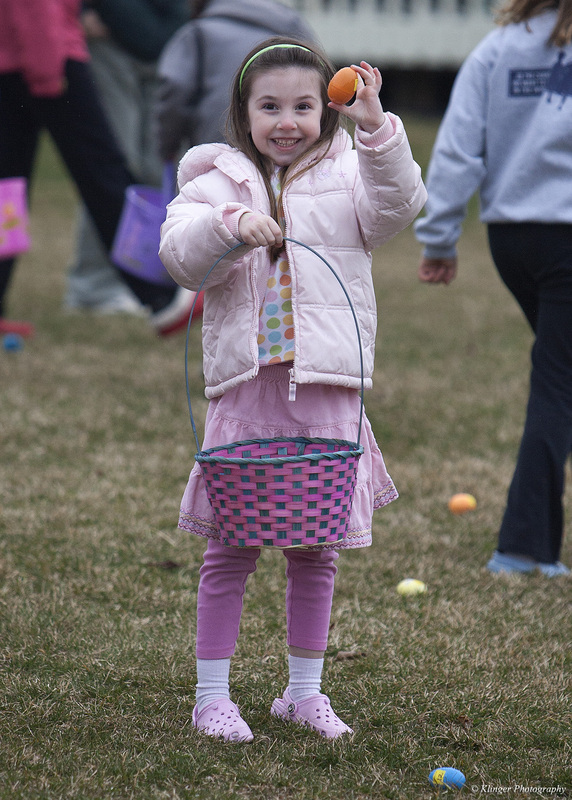 Here she is on April 5th, 2009 at our neighborhood Easter egg hunt. This is from May 10th, 2009 during our annual “help Mom plant the garden” activity. At this point, she was pretty afraid of worms, so she didn’t like to actually get her hands dirty too much, but she certainly liked working the hose! 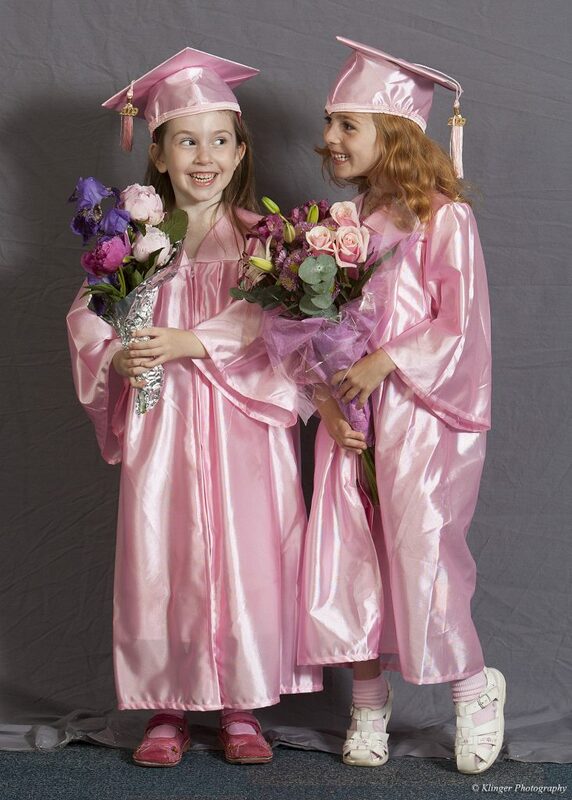 I helped take a bunch of formal pictures for Anna’s Tutor Time kindergarten graduation. There were a lot of nice pictures, but this is one of my favorites with her and her good friend CassE on June 11th, 2009. A little face painting at a summer Tutor Time party on August 25th, 2009. 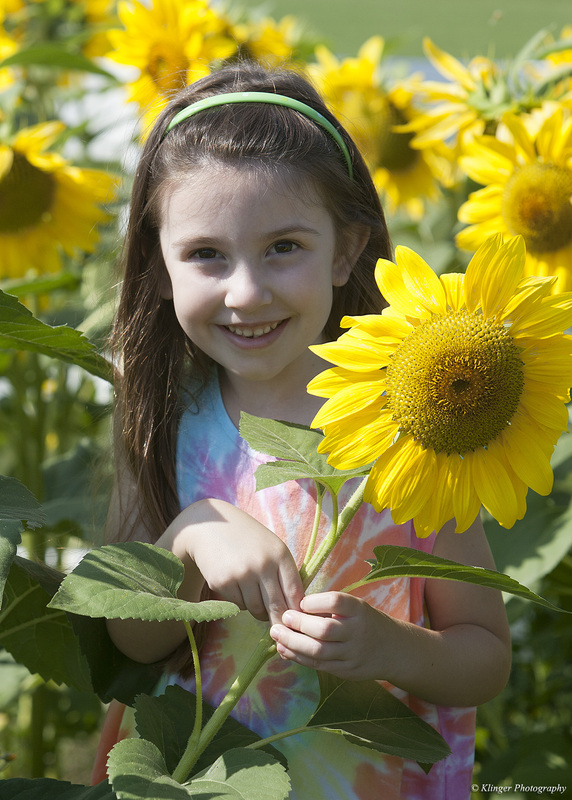 I took some family pictures for a friend near Domino Farms where they have a bunch of sunflowers. I managed to sneak in a couple good ones of Anna too. 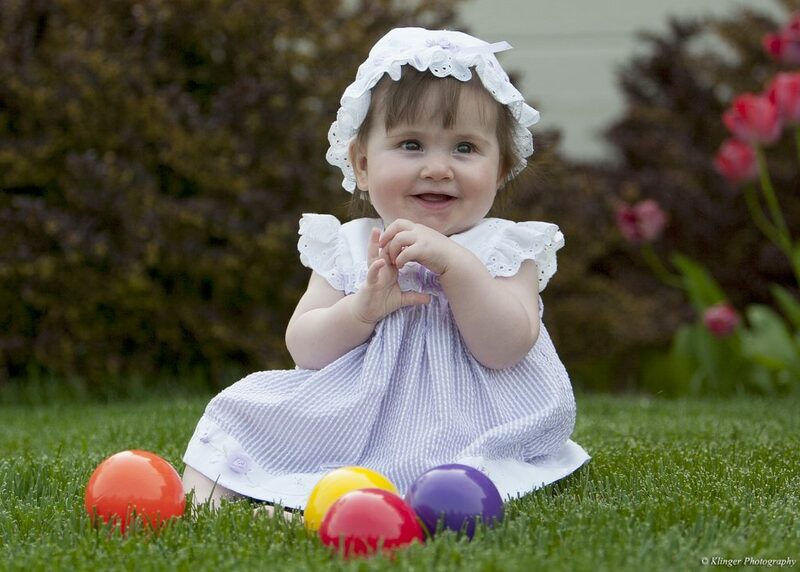 It was pretty hard to take a bad picture of Anna back then with her extreme cuteness! 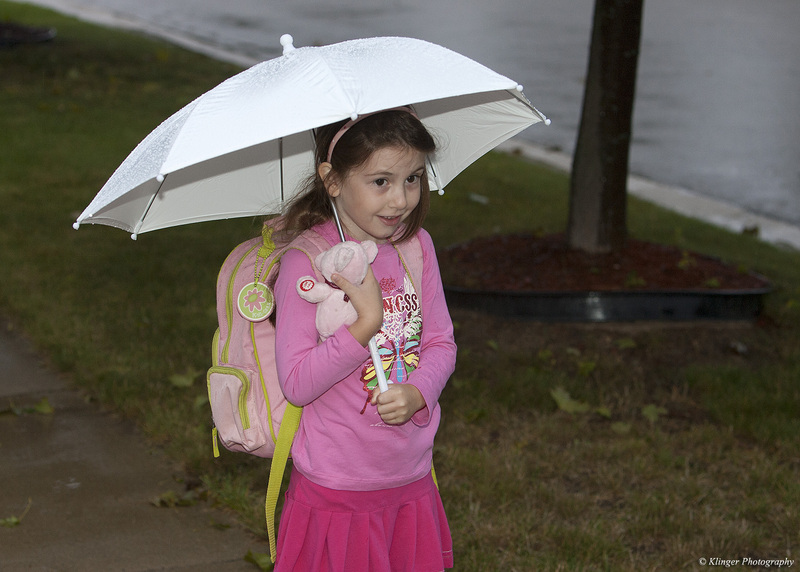 Here she is on the way to the bus stop for her first day of Lawton (1st grade). It was a rainy day, and she was nervous, scared, and excited all at once. If I recall, her parents also had similar feelings at the time. This was September 8th, 2009. To go with the last picture, here she is on the same day coming off the bus for the first time. She is extremely excited to tell us about her day. We were very proud of her that day, and we have been every day since! Welcome to year five, covering September 2007 to 2008. 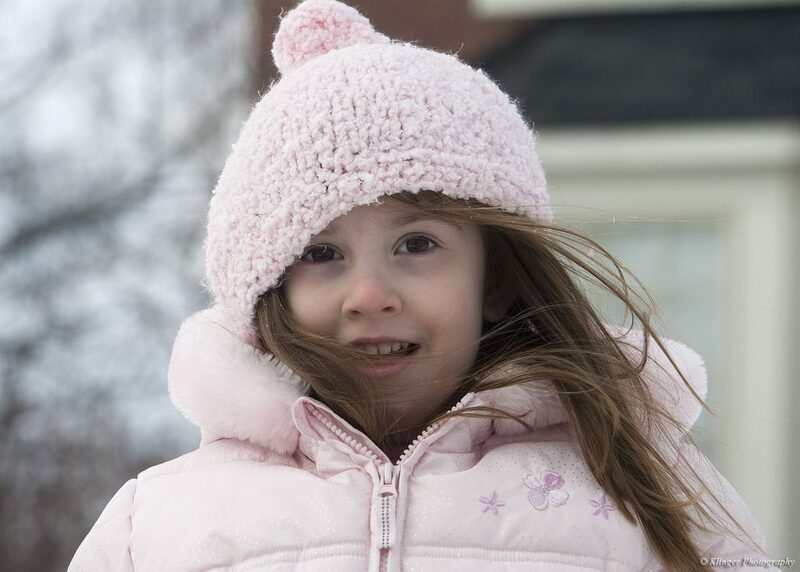 This was Anna’s final pre-school year leading up to her first day of Kindergarten in the Fall of 2008. The first picture is a bit out of order chronologically, but I wanted to start with this one because it’s one of my all-time favorites. This was during our traditional Mother’s Day garden planting day around Memorial Day, taken on May 4th, 2008. 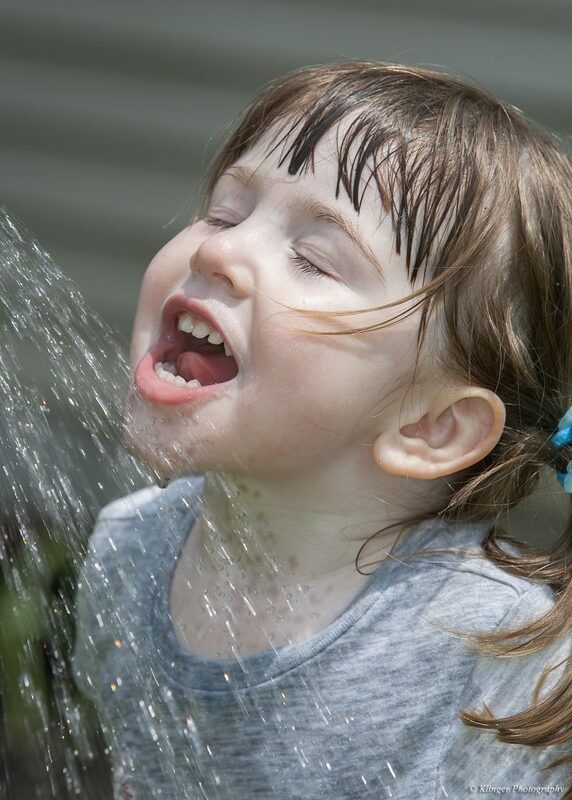 Vicki is using the hose to cool Anna off on this warm day. Life is good! Rewind a couple months to Halloween night 2007. 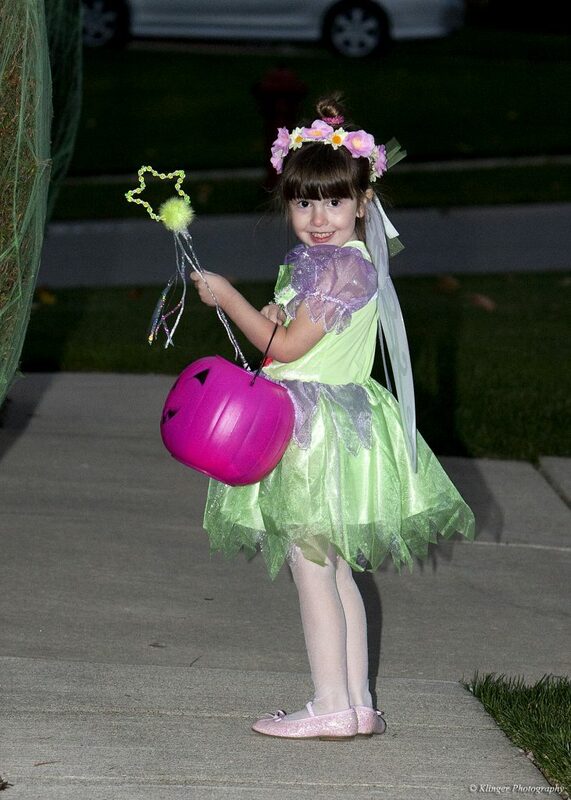 Our little fairy princess is ready for some serious candy collecting. This was taken at the Tutor Time holiday show on December 19th, 2007. 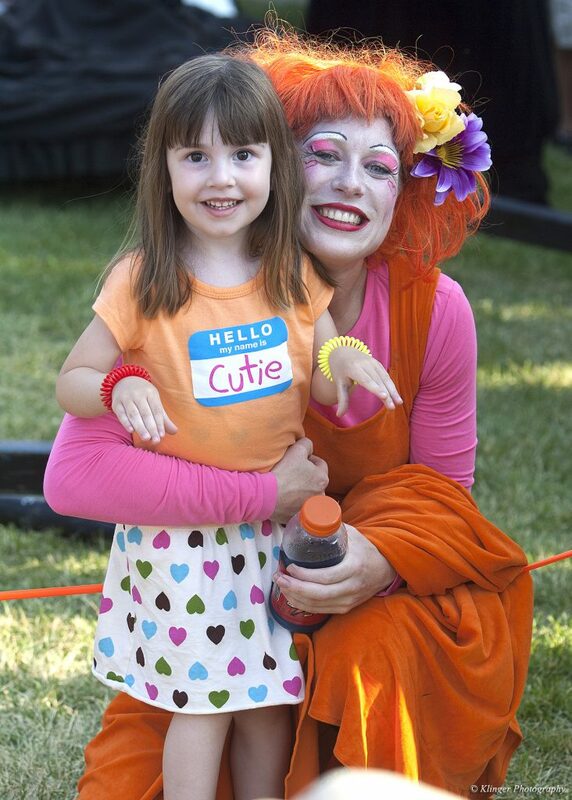 If I remember correctly, this was after the show, and kids were lining up to say a few words on the mic for fun. Of course Anna had to get in on the action. This and the following picture were taken on March 3rd, 2008. We got a late snow that winter, and Anna took full advantage of it. Here is the final result! Vicki definitely helped a lot, but Anna was the master designer. You can see the cute “prototype” Anna is holding. 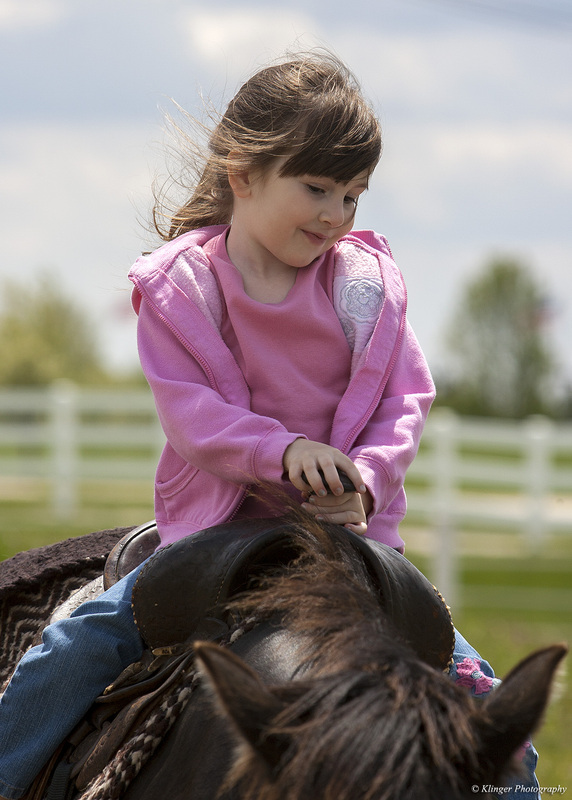 Here Anna is riding a full-sized horse at Domino’s Farms on May 17th, 2008. 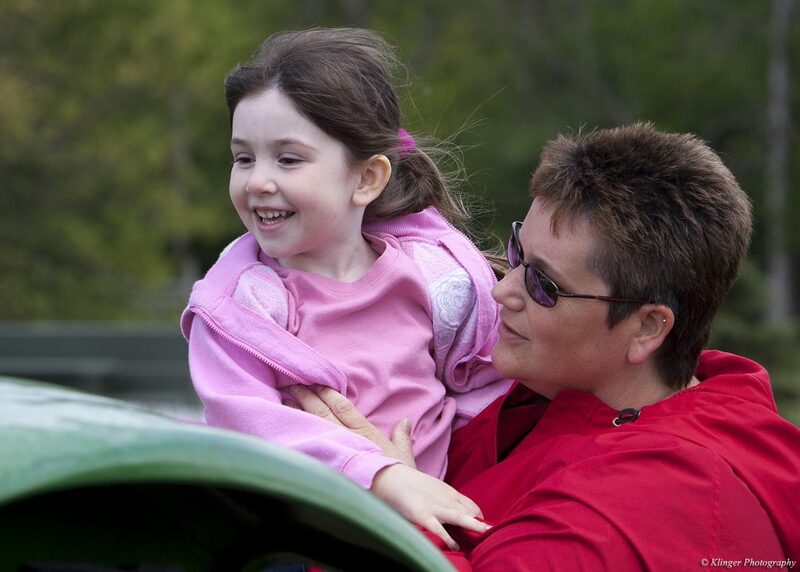 This was also at Domino’s Farms that same day, enjoying sitting on a real tractor with her Aunt Debbie leading the way. 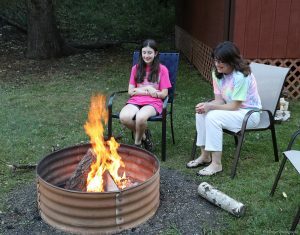 This was taken on July 6th, 2008 at Mike and Cheri’s house. Getting ready for a swim doing a pre-game nose bop. Now in the pool at Mike and Cheri’s house. 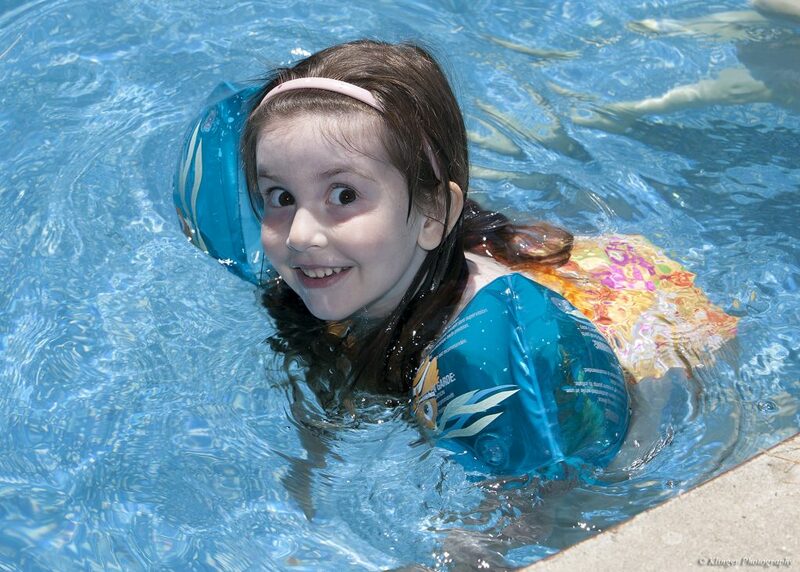 Anna was definitely a tentative swimmer back then, but water-wings made it all possible! September 2nd, 2008, at 8:32 am. 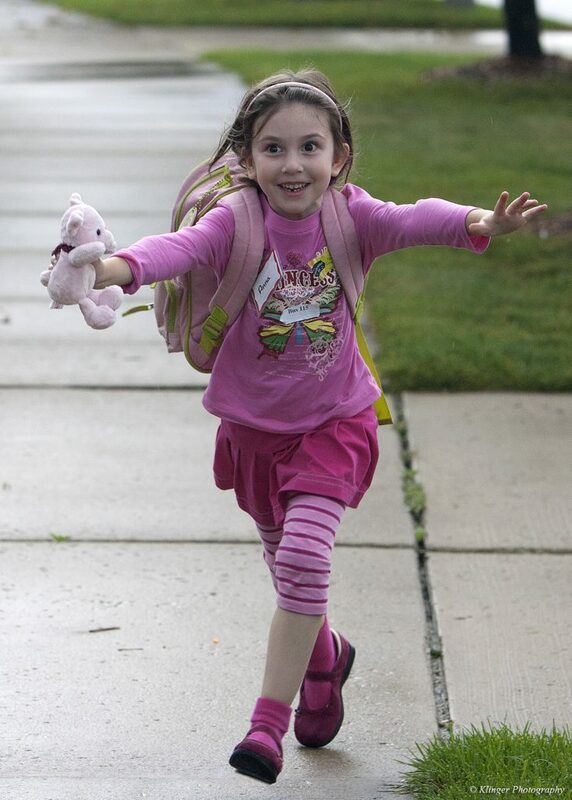 Anna is heading off to her first day of Kindergarten. 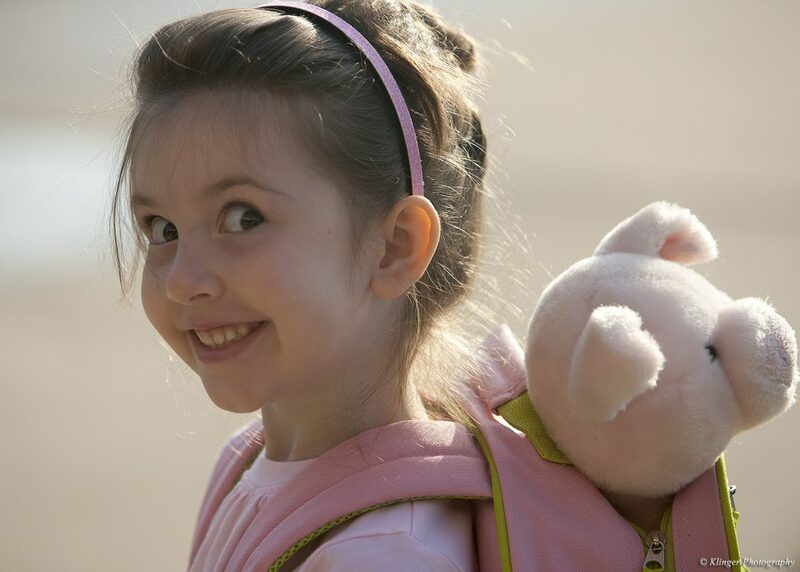 “Piggy-pink” is riding along to help her not be as nervous. Welcome to year four, covering September 2006 to 2007. 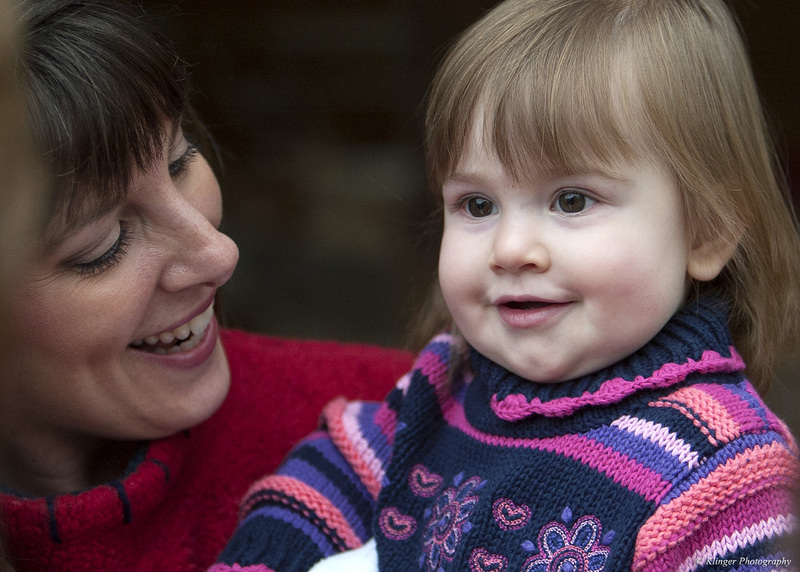 This was Anna’s pre-school year at Tutor Time where she really enjoyed herself. The teachers and learning opportunities there were all top notch. Here she is getting a pony ride without any help from Mommy. This was late October, 2006 at Jenny’s Farm. 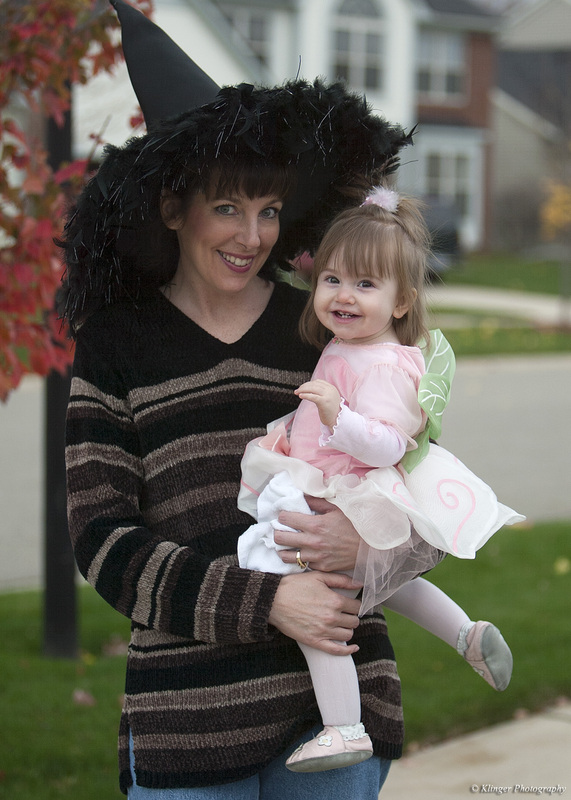 Here is our little butterfly on Halloween night. 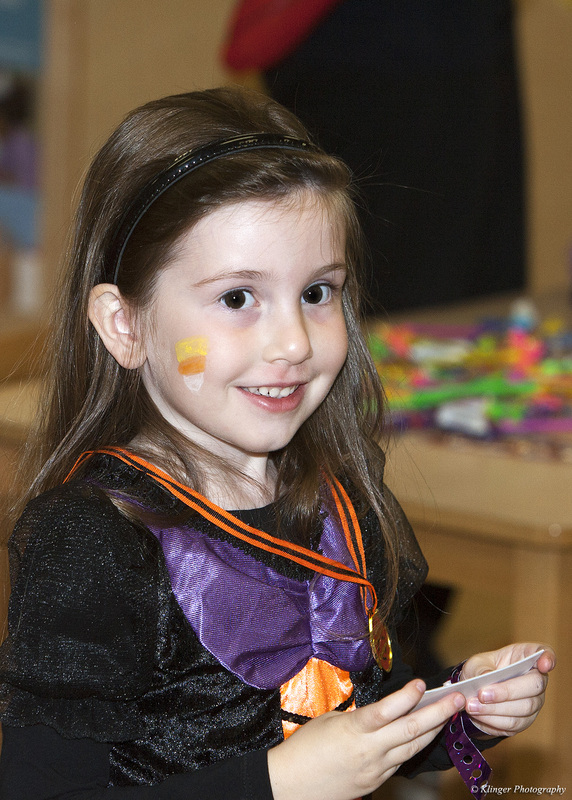 These are definitely the magical years for Halloween! 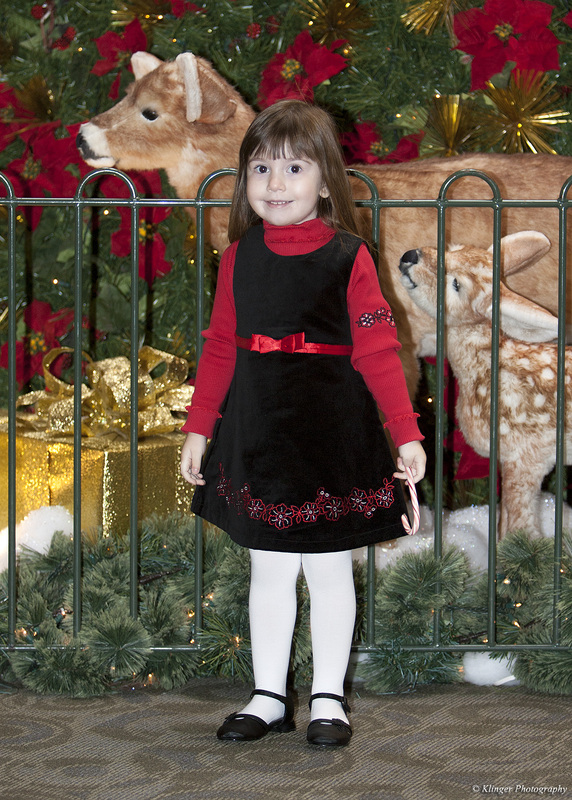 This was taken at the Briarwood Mall Christmas display in early December. 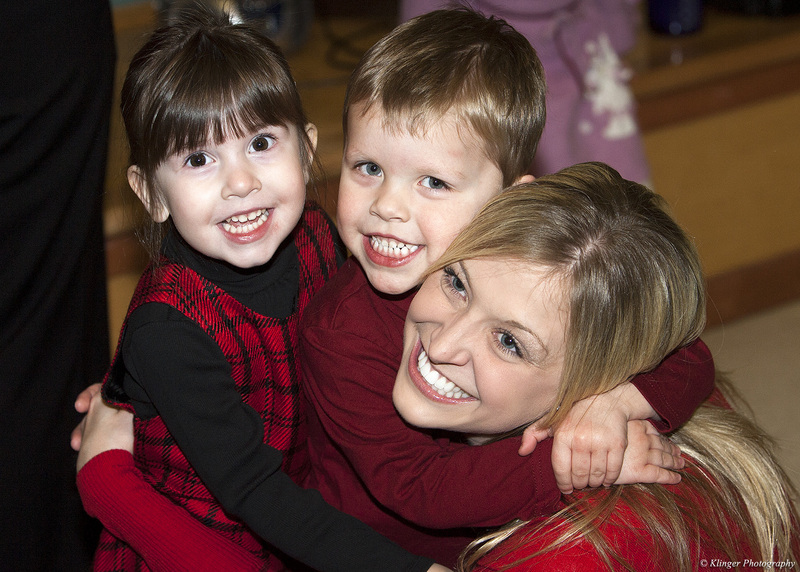 We went mainly for the sitting-on-Santa’s-lap experience, but I think this picture is much cuter than any of those. 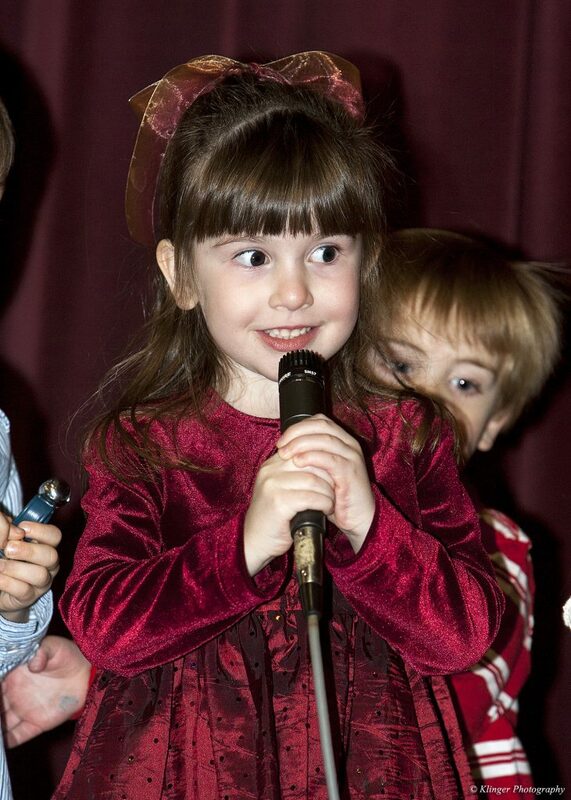 I love this picture from the Tutor Time holiday performance. Anna is with her friend Max and one of her favorite teachers, Toni. This picture is from May, 2007. In the continued tradition of helping Mom plant the Mother’s Day garden, Anna is doing some serious work here! From the same day, here is the dynamic duo putting the final touches on the garden to help scare away the animals. This is from late June, 2007 at Top of the Park in downtown Ann Arbor. Anna was lucky enough to get her picture taken with one of the Australian acrobat performers of “Strange Fruit”. I can confirm that her name-tag in this picture is 100% correct! This is from early July, showing off her freshly painted fingernails at Tutor Time. Also from Tutor Time on the same day, here she is with her triplet friends Aditi, Rohini, and Bhargav. 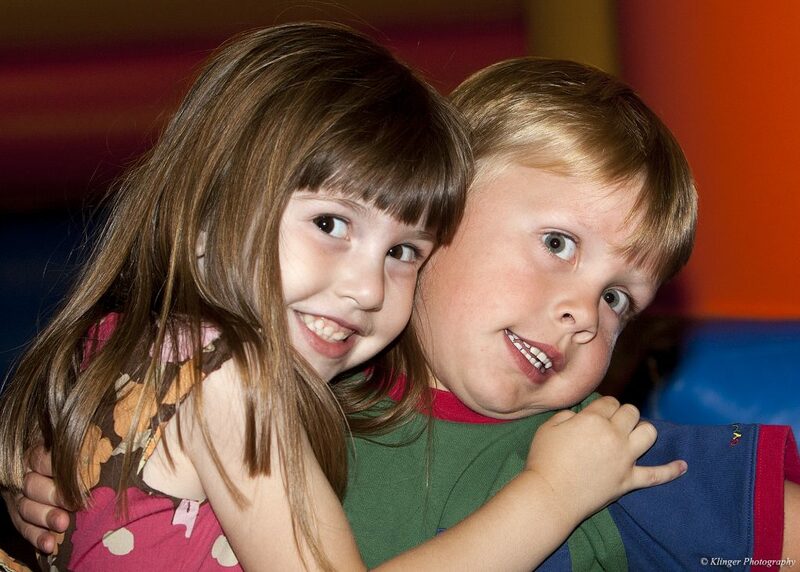 Here is one from her 4th birthday party at Jump City. Max makes another appearance, but he is a little less sure about what’s going on this time! Welcome to year three, September 2005 to 2006. This year was about the time that Anna’s core personality really became recognizable as who she is today. 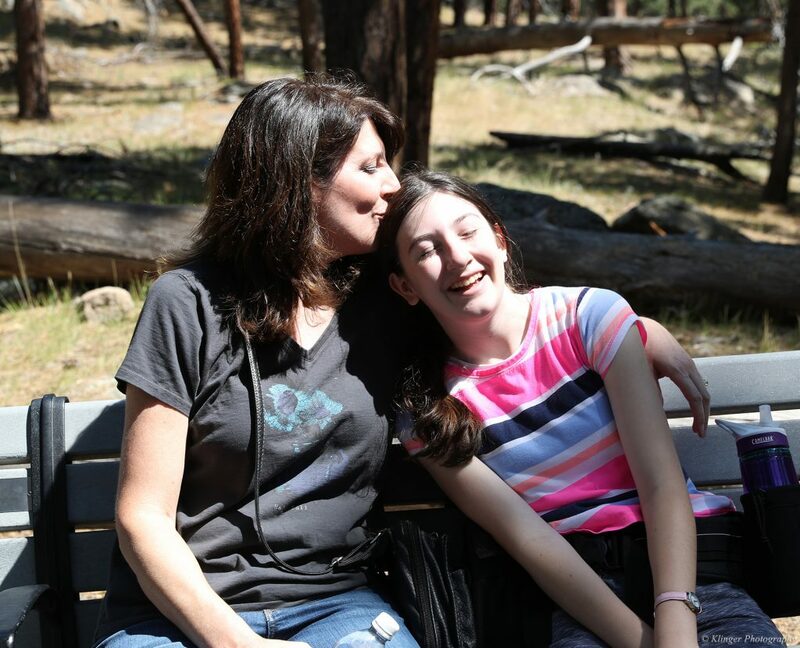 She was always happy and fun to be around, but it became really obvious that she was going to be a great person with her kindness and empathy. This is one of my all-time favorite pictures from Halloween night, 2005. She is ready for her big adventure, but still wanted to make sure Mommy was close by. It was only a couple days earlier that she went to the emergency room to have her hand checked out. She managed to smash it in the door jam at Tutor Time. Luckily, nothing was broken and there was just some swelling and bruising. Nothing that could possibly stop the Halloween festivities! 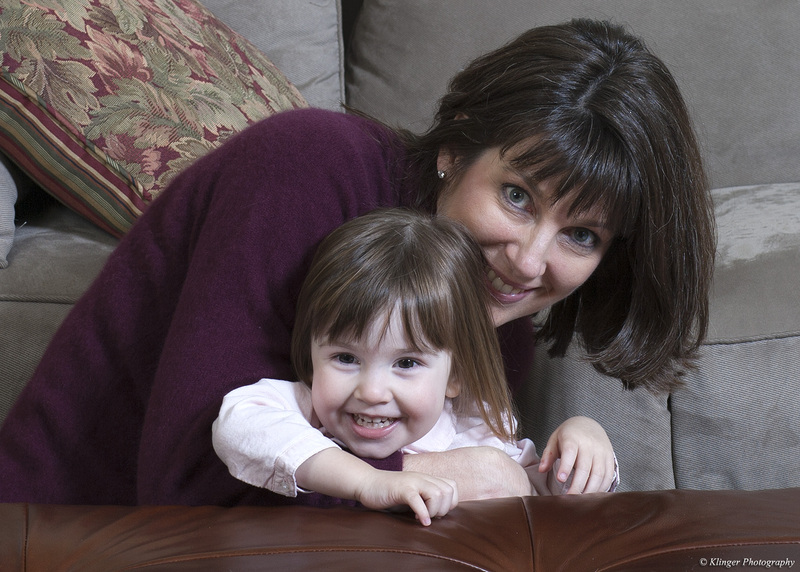 This one was from just before Christmas, from one of our attempts at getting a good picture for our yearly cards. 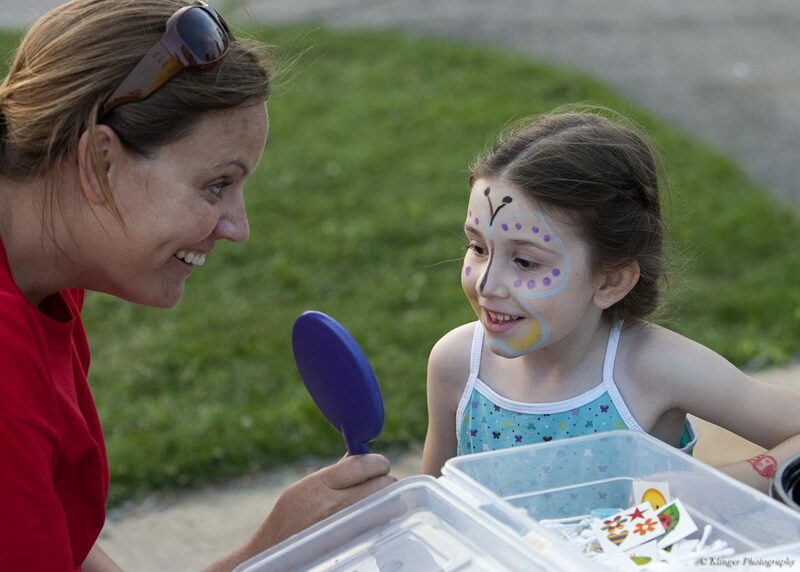 We didn’t wind up using this, but I really like the picture of both Vicki and Anna. Here is a picture from Christmas morning at Grandpa Jerry and Robbie’s house. Living large! Here she is at 2 1/2 years old right out of the tub. 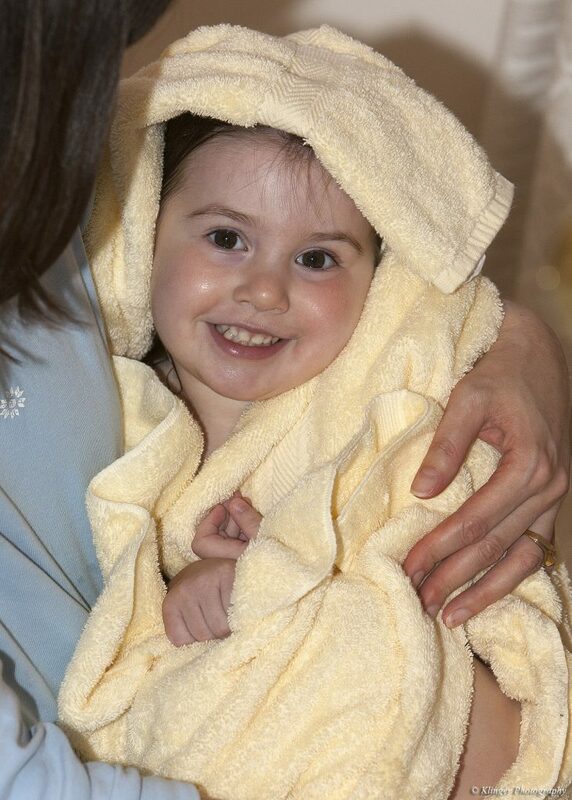 There were some super-cute ones of her in the tub too, but I don’t want to embarrass her even more than I already am. This is from May, 2006. 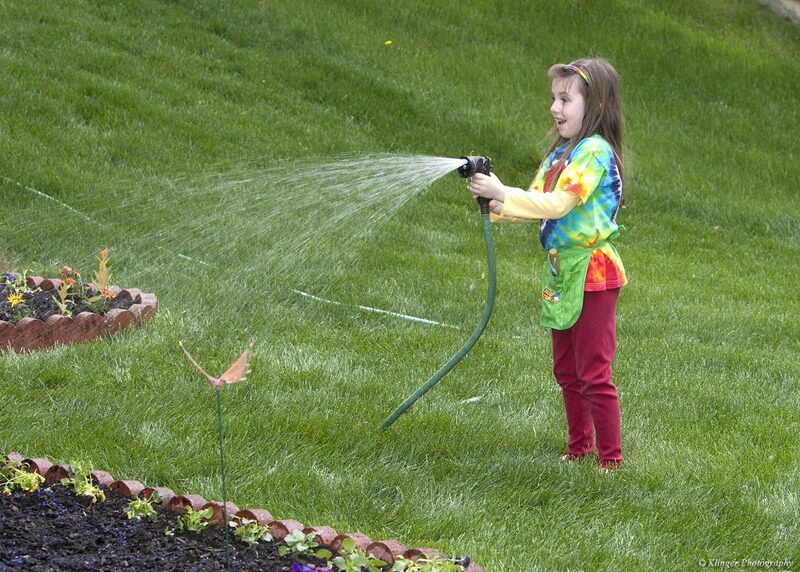 During these years, Anna always helped her Mom plant and water the garden. This year was special in that Grandma Pat was also here for a visit. She was the one holding the hose here. 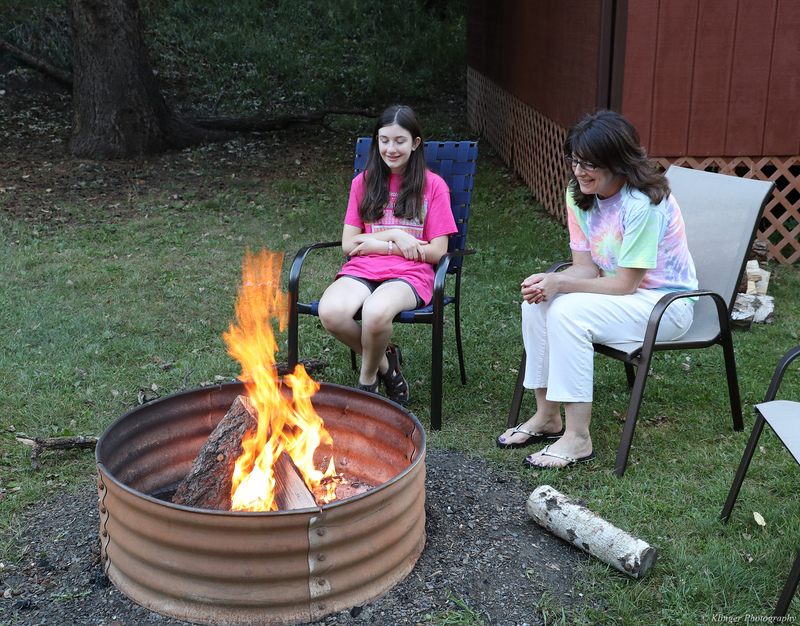 We always have a great time at Kevin and Michelle’s 4th of July party at Portage Lake. 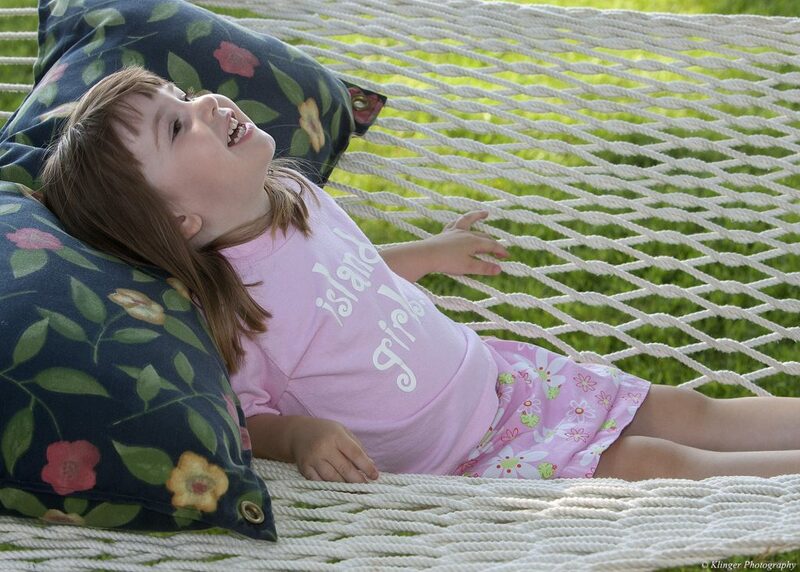 This was Anna chillin’, taking a break from playing. 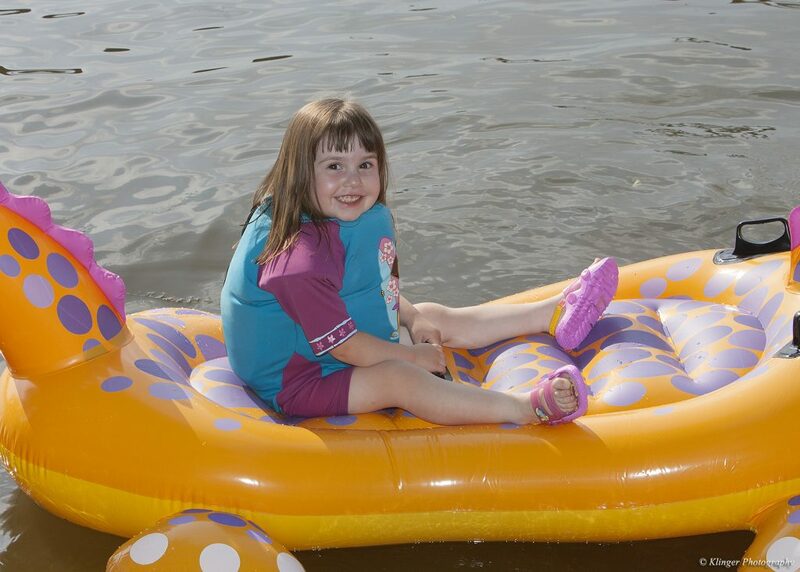 This was also from the same 4th of July party, enjoying a sweet ride on the inflatable dinosaur! 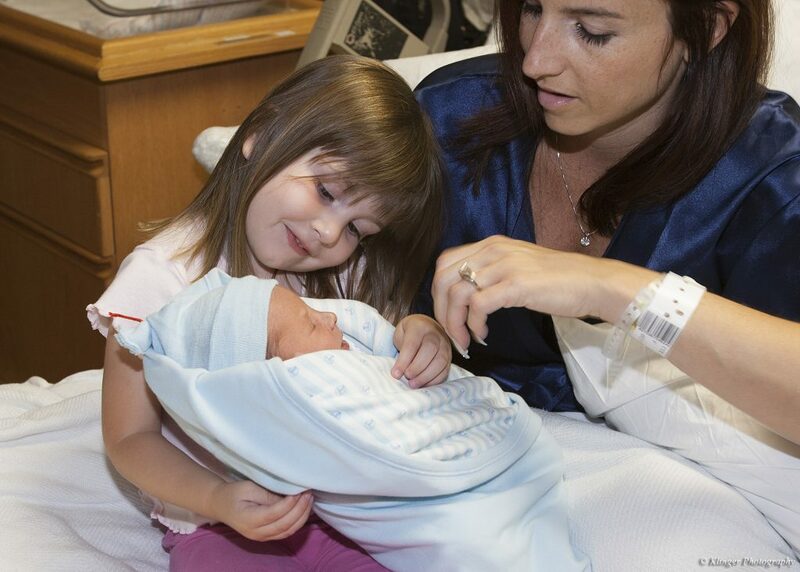 I really like this picture of Anna meeting her cousin Jackson for the first time. He is one day old here on September 1st, 2006. 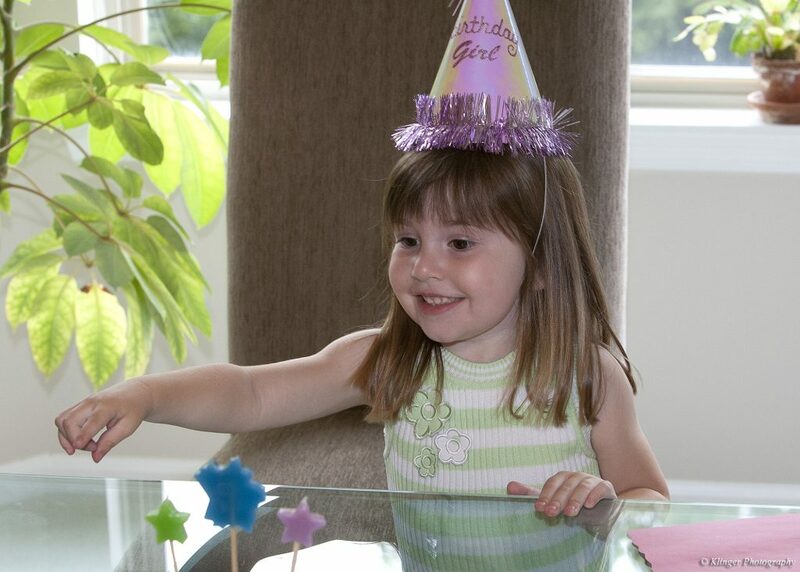 Here is Anna at her 3rd birthday party. The cake theme was from the movie Madagascar. I seem to recall some dancing at the party to the song “Move It, Move It” which was incredibly cute. 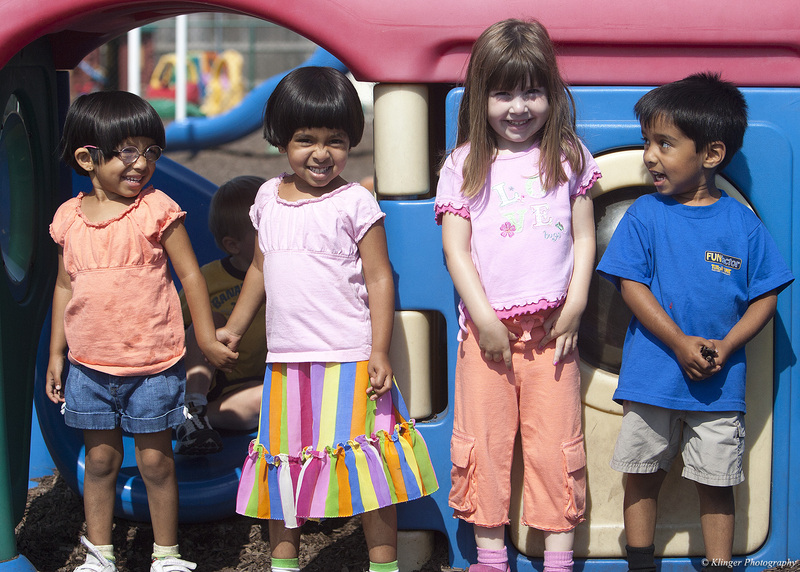 Speaking of incredibly cute, this is Anna with three of her favorite friends from Tutor Time. 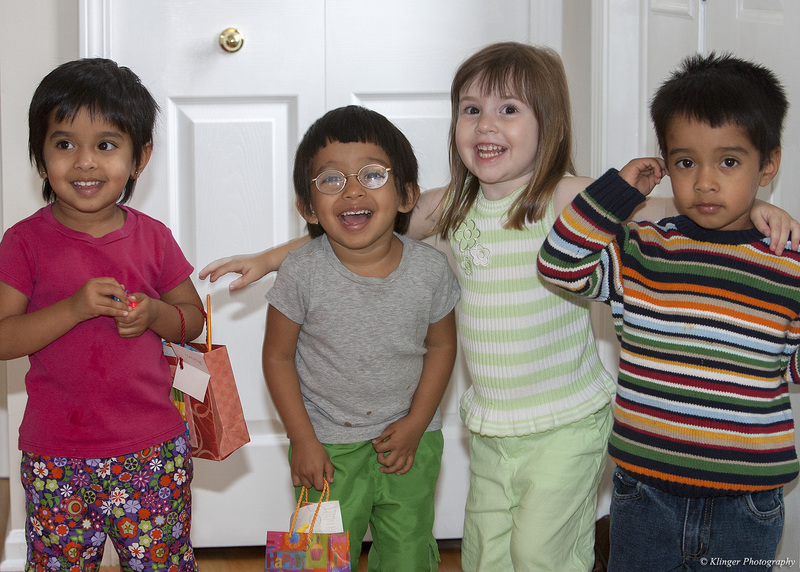 Aditi, Rohini, and Bhargav are triplets and really loved Anna. Unfortunately, they moved away before elementary school, so Anna didn’t get to grow up with these guys as friends, but I’m sure they are all doing great. Welcome to year two, September 2004 to 2005. 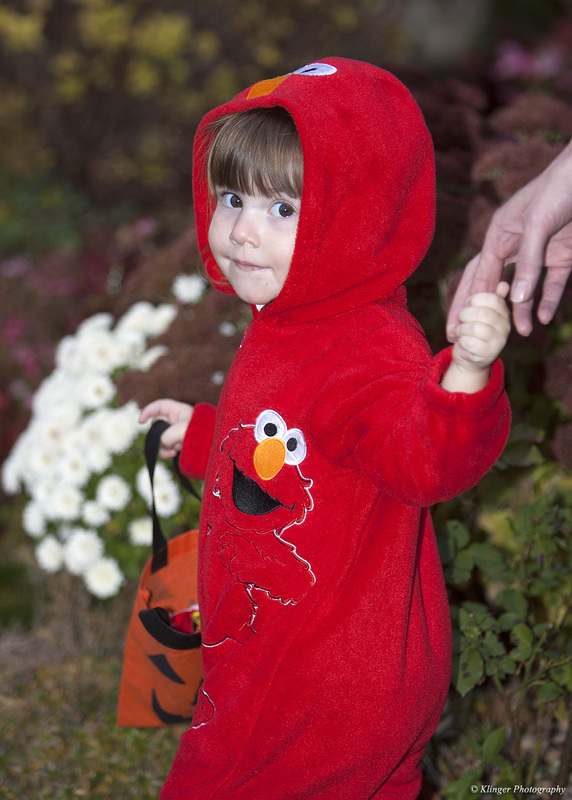 As you’ll see in this post (and in future ones), Halloween is Anna’s favorite holiday. I first upgraded my camera during this time frame, so I experimented with some posed studio shots with her. Some turned out as expected, and some didn’t, but she was always super-cute! This shot was taken on October 24th, 2004 at Wiard’s Orchard. 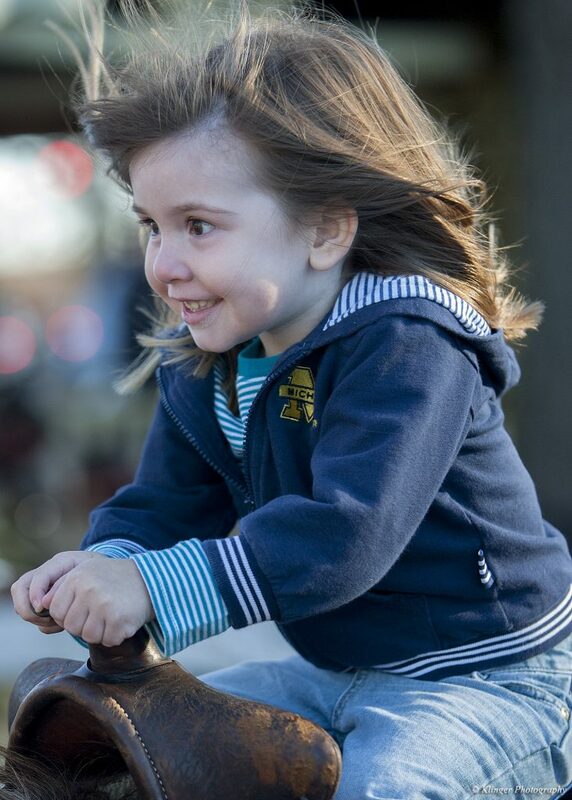 She got to ride a pony for the first time that day too. Most of those pictures had more of a concerned/scared face though. 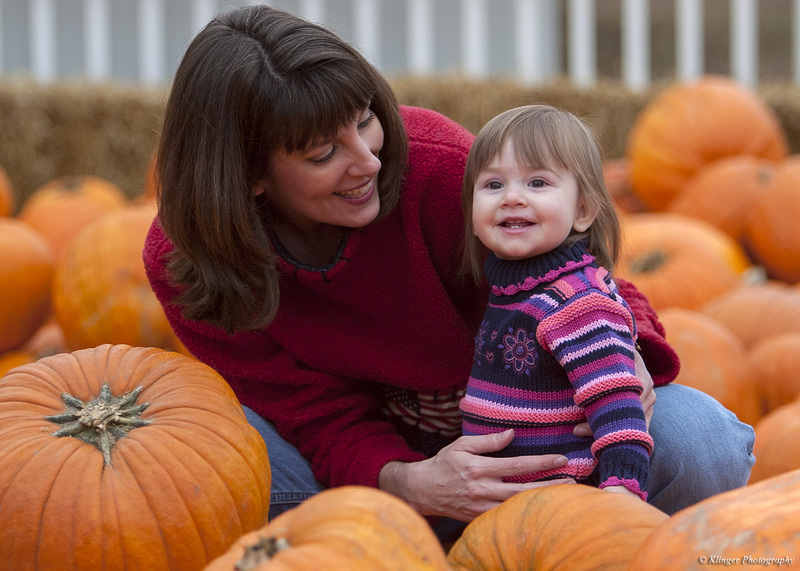 This picture was taken later that afternoon in the pumpkin patch at Wiard’s. It one of my all-time favorites of both Anna and Vicki. 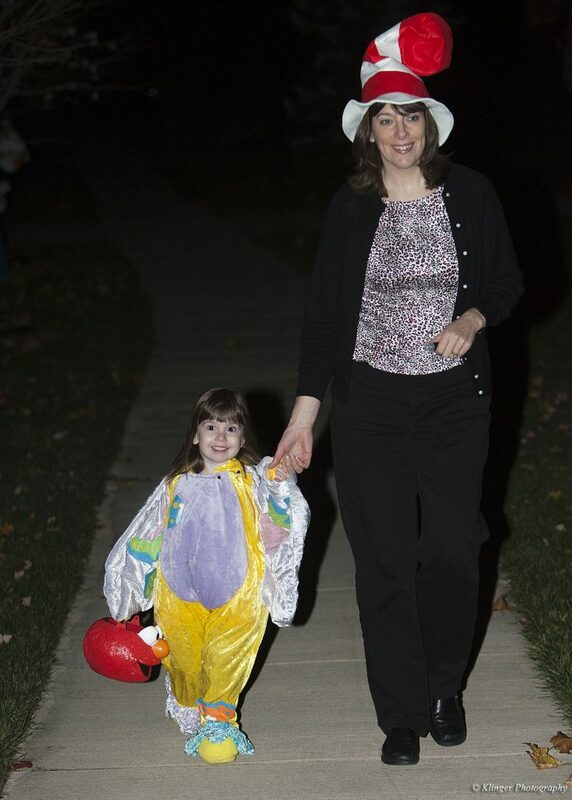 This is Halloween 2004 as we walk to a neighborhood block party. So many cute kids in our neighborhood! 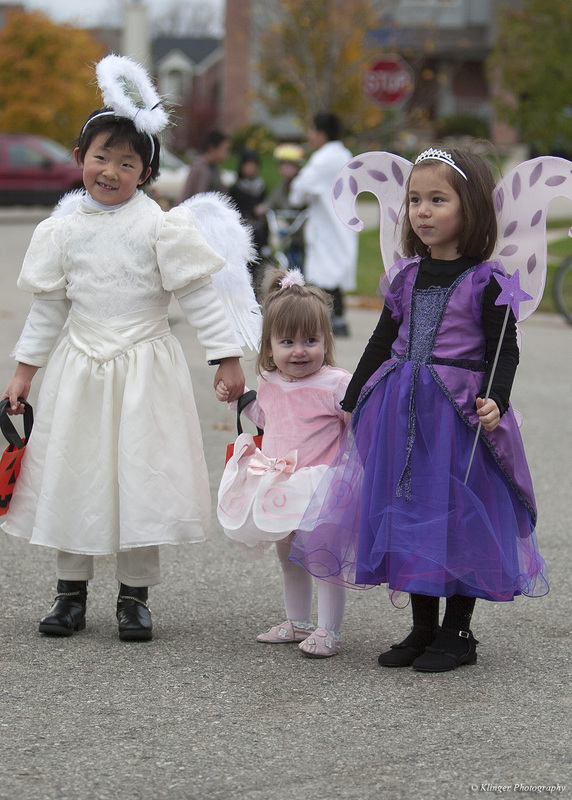 This is Anna with her neighbors Alexandra and Olivia. This was taken on February 13th, 2005. I had just upgraded my camera to a Canon 1D Mark II. That camera was a huge jump from the original 1D, twice the resolution and at least a full stop better high ISO performance and dynamic range. You may or may not notice a difference in quality at this size, but trust me, it was a big deal at the time. I had also recently bought some studio strobes and a couple basic backdrops, so what better practice than my favorite subject. The problem here was, she had a tendency to run back to us instead of posing. I still managed to grab a couple cute pics like this one. 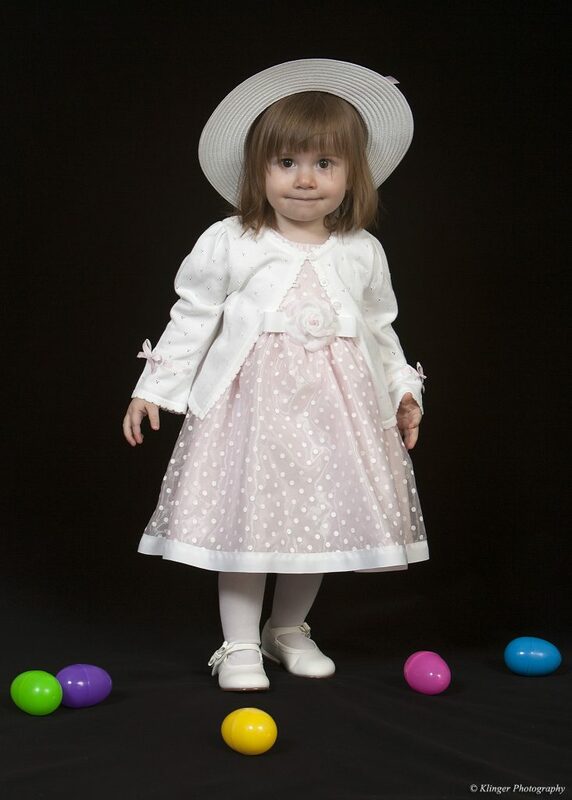 We tried again for some Easter portraits in front of the studio lights about a month later, and she did much better standing still long enough for me to take this shot. She is just over 18 months old here. This is from Memorial Day 2005. Her Grandma Pat was in town for a visit and she really enjoyed showing her around the yard. 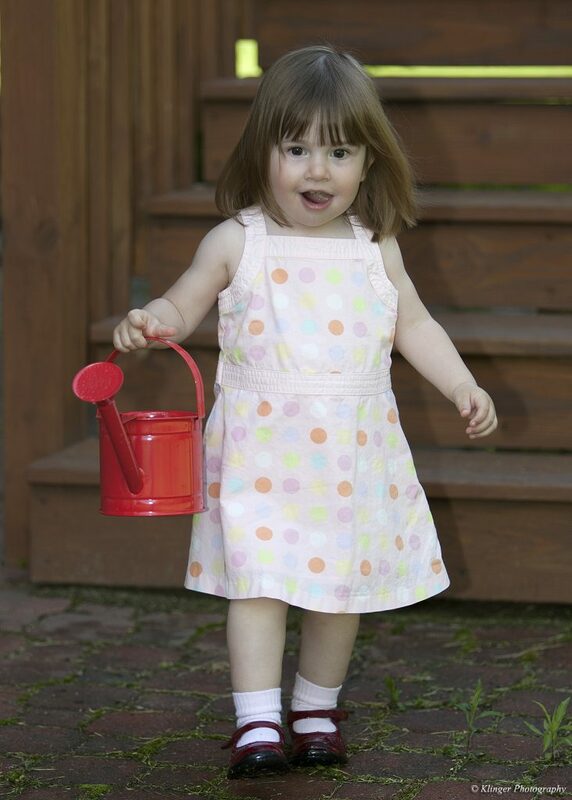 Here she is on the same day again with her watering can. 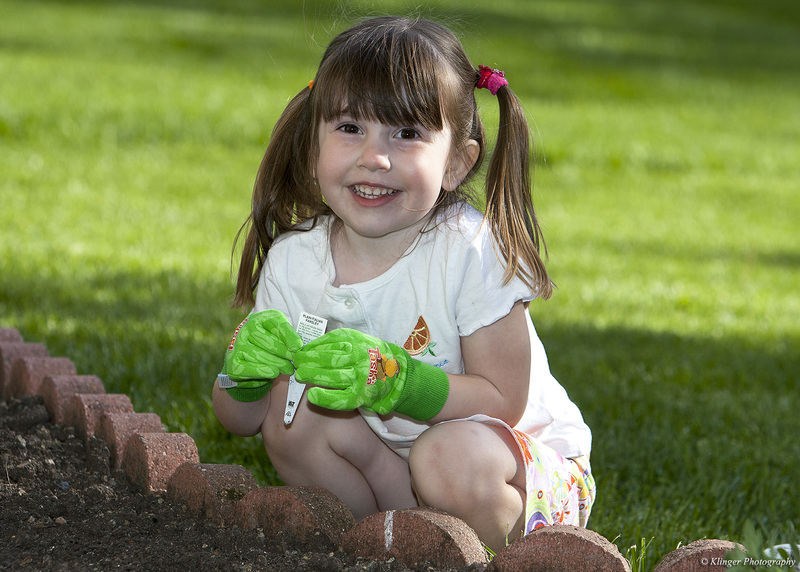 She loved helping her Mom with the gardening, and it became a tradition to help her plant every Mother’s Day. 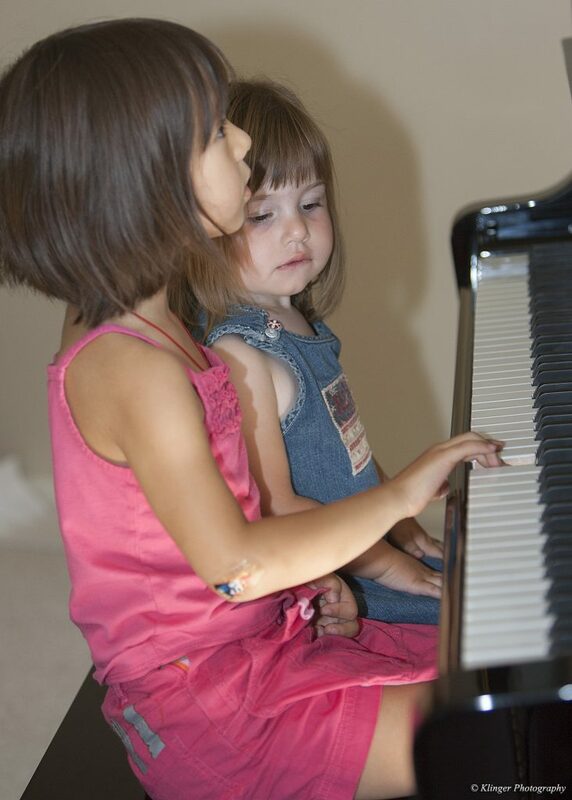 Here she is on August 27th, 2005 at our neighbor’s house watching Olivia play piano. You can see the gears turning in her head. They are still going strong today! 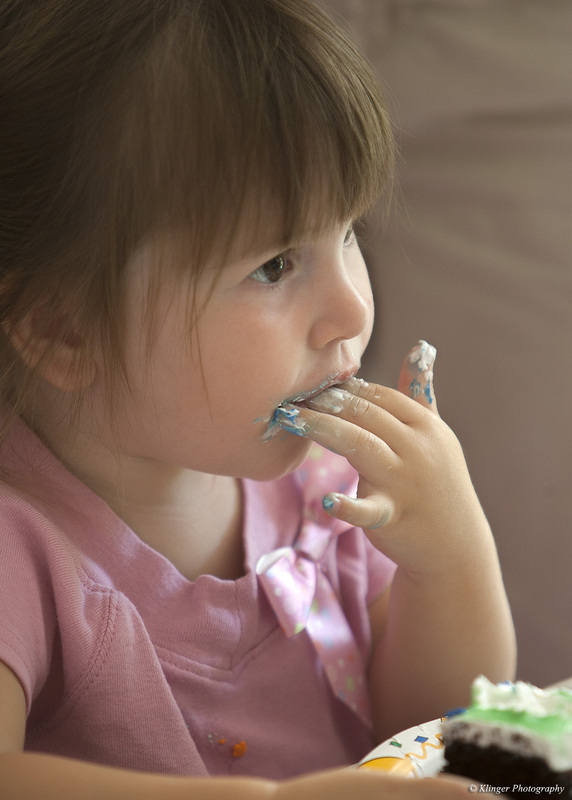 At least some of the frosting is finding its way in at her 2nd birthday party. I’m still amazed at how light her hair was back then compared to now. This will be an ongoing series of posts where I pick my 10 favorite Anna pictures from each year of her life. That is trickier than it sounds, as I’ve taken thousands of pictures of her over the years! I’ll put them in chronological order and give a brief description of each one. This is Vicki, of course, but Anna is in there waiting to make her appearance. Vicki’s water broke at 2am on September 10th, 2003. This picture was taken at 4:11am after showering and getting ready for our trip to the hospital. To make a long story short, after arriving at the hospital around 11am, and after 5+ hours of 100% natural labor, the doctors discovered that Anna was breech! Surprise! 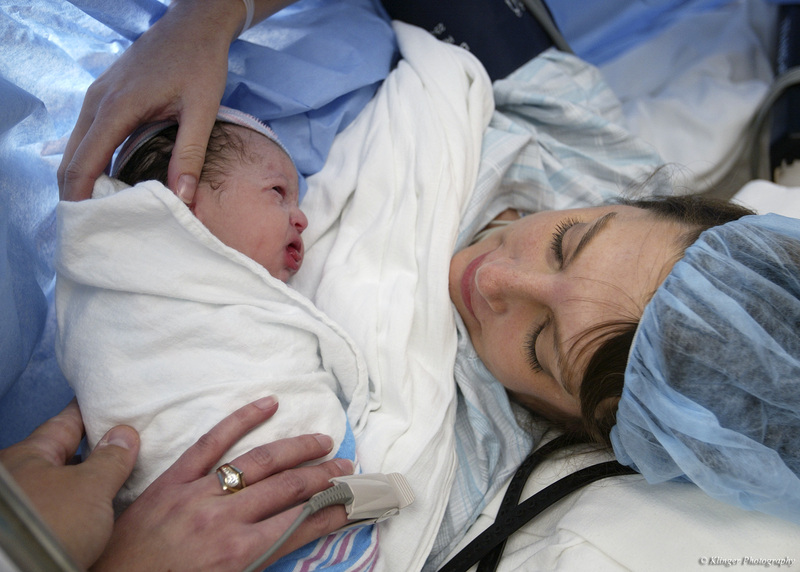 There was no real choice except to proceed with a C-Section delivery. Vicki asked the doctors if I could bring my camera into the operating room to take pictures, and they said sure. I got some really neat pictures of the actual procedure, but this is my favorite non-bloody one. I even got my hand in there for good measure. According to the time-stamp on the picture, Anna is about 17 minutes old here. Anna Raquel was officially born on September 10th, 2003 at 5:29pm. 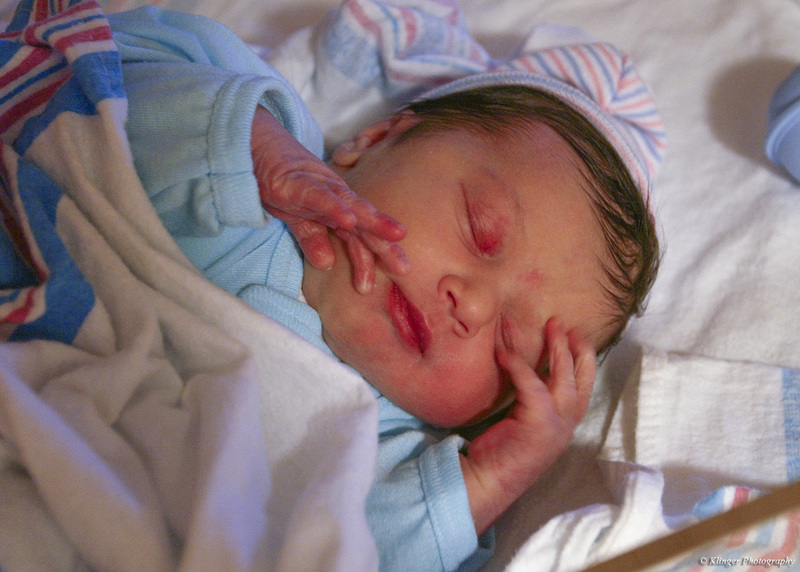 She was 7 lbs 9oz, and 20″ long. Here she is the next morning at 8:02am, less than a day old. We wanted to get a nice shot to use for our official announcement picture. This was the final result taken on September 19th. 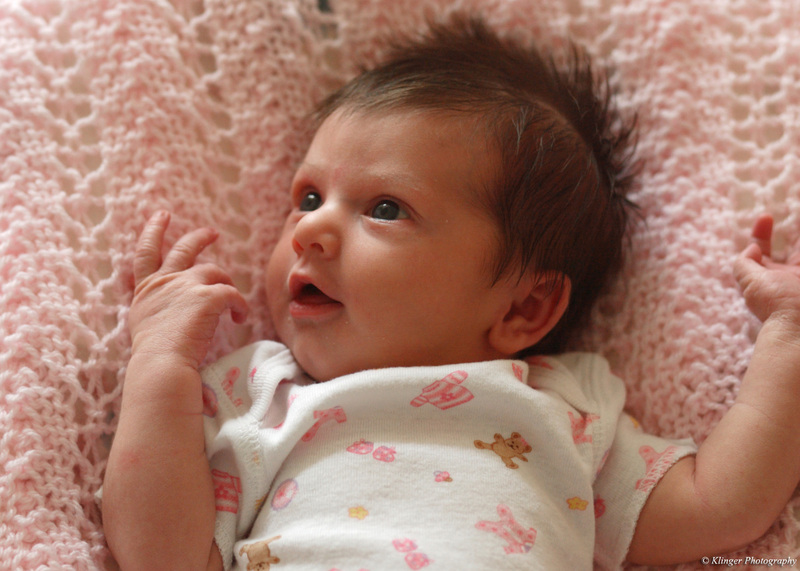 She is 10 days old here. Fast forward a couple months. 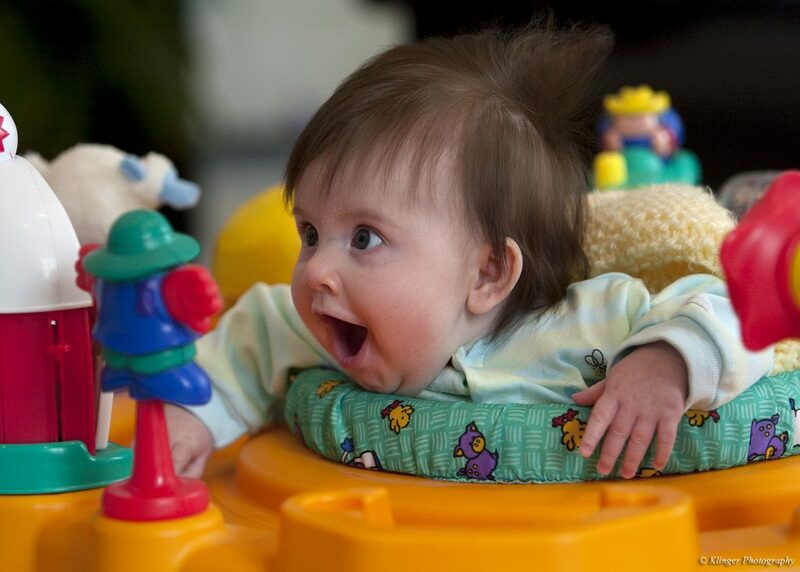 This picture was taken on January 11th, 2004, so she is 4 months old. 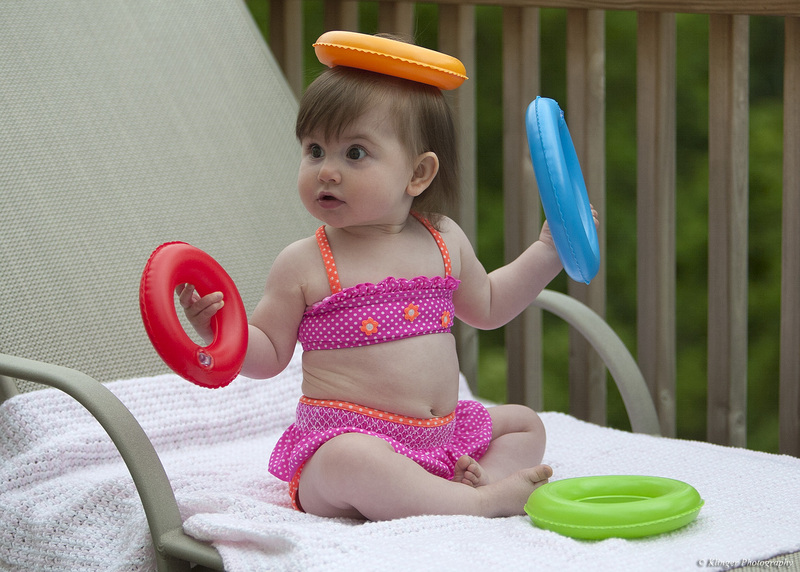 This was the first time we put Anna in her saucer. We had to put a blanket in the seat with her to keep her upright, but as you can tell, she really enjoyed the experience. “Piggy Pink” makes her first appearance at 6 months old. 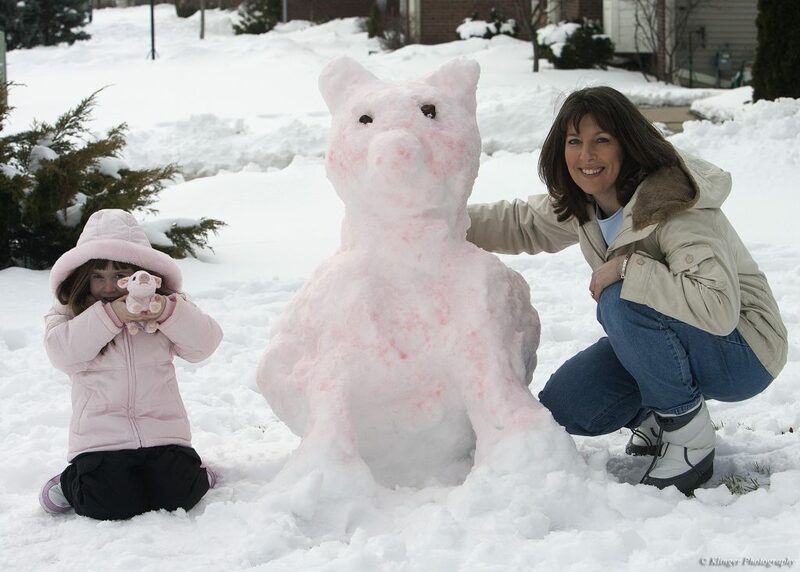 As many of you know, Anna loves pigs, and this was the beginning of that relationship! Special thanks to Lisa Spencer for giving her this stuffed animal to go along with one of her favorite childhood books, If You Give a Pig a Pancake. Now 8 months old, I did a photo shoot outside. This was her first real experience being on grass. Vicki tells me this was right after her first haircut. Here she is on June 12th, 2004 at 9 months old, playing with her rings on our deck. 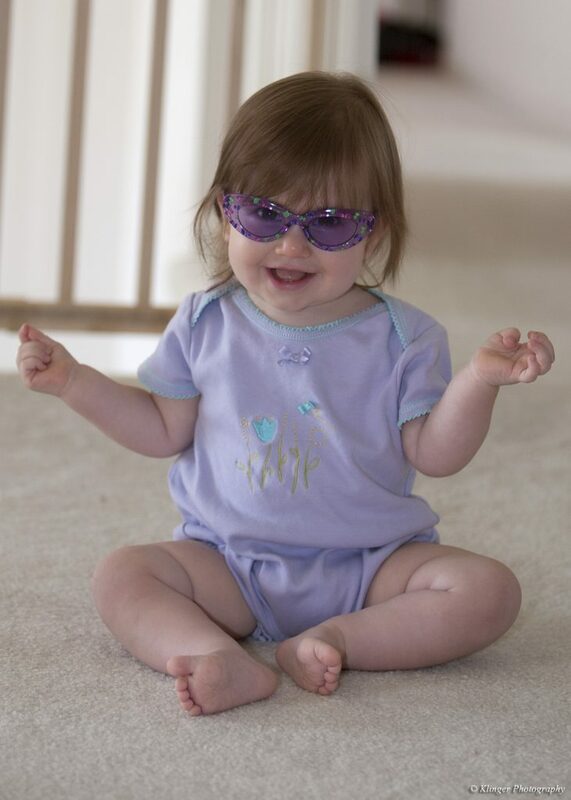 At 11 months, our little girl is enjoying the life of a super-star diva. 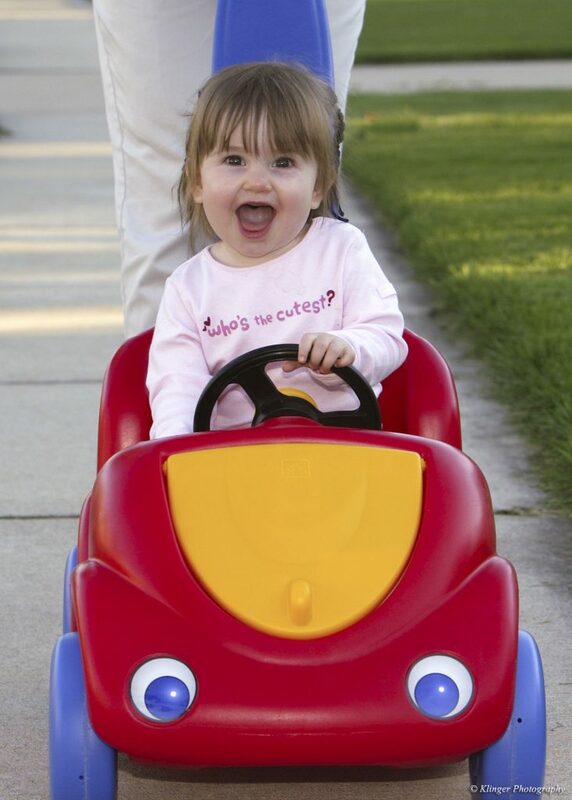 September 10th, 2004, Anna’s first birthday. This was one of her first birthday toys. As I write this in 2017, she is not that far away from driving a real car! Enjoy these early days while you can. My recommendation is to take as many pictures and videos as possible, as you’ll wake up one day and they’ll be all grown up! Keep an eye out for future posts like this covering the 10 best pictures from each of her years growing up. 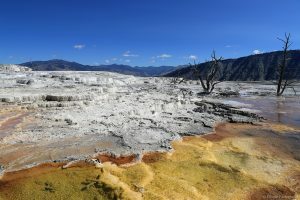 This is the final post covering our Yellowstone road trip covering some of my favorite wildlife pictures. Unfortunately, we didn’t see any bear or moose, but we did manage to see some cool wildlife that you don’t see too often roaming around wild in Ann Arbor, MI. 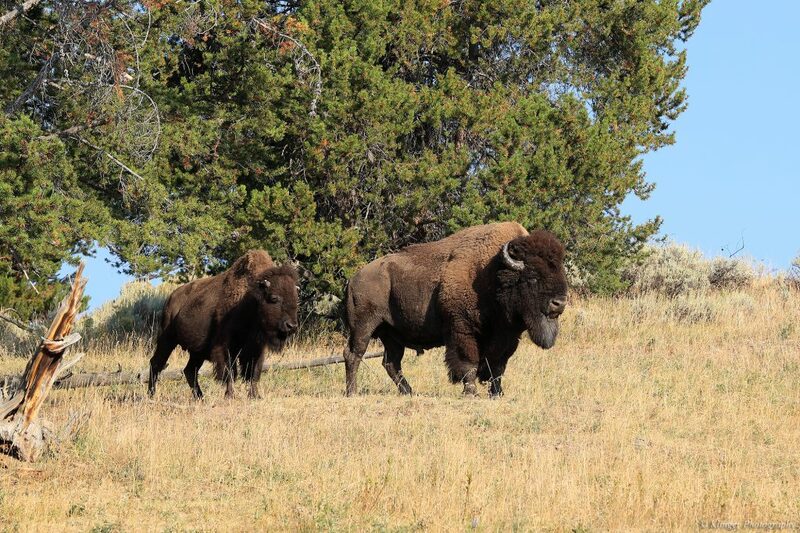 We did see a TON of buffalo, or American Bison. I’ll start with probably the most dramatic shot. We were on a walking path when we came across this magnificent pair. This was taken at 200mm focal length, and is barely cropped. That means they were pretty darn close!! 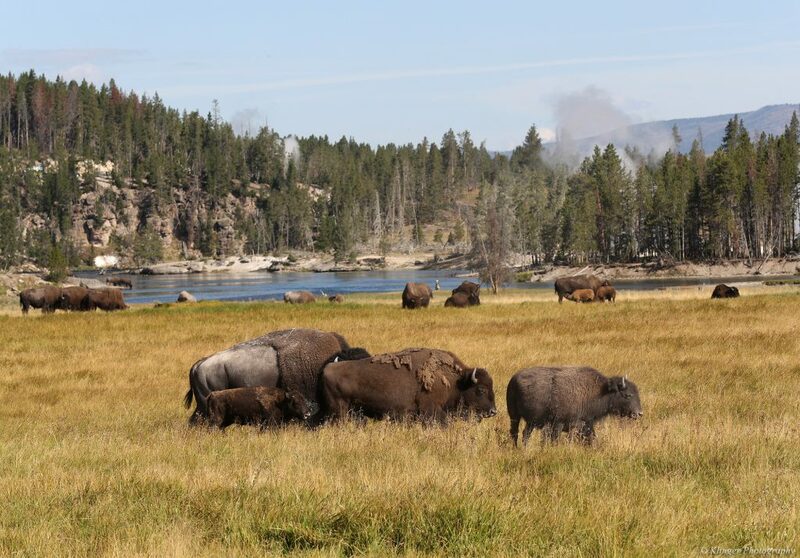 While there are many buffalo around Yellowstone these days, and it’s very easy to get pictures of them, it’s still very challenging to get them in great lighting. I’m extremely happy with how their faces and eyes were lit by the sun in this picture. Of all the buffalo pictures I took, this was the best. 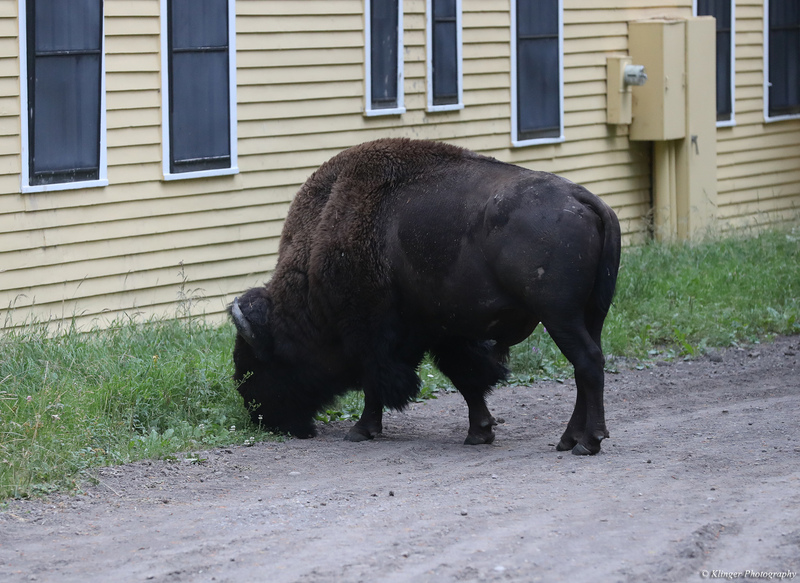 I really like this next buffalo picture too. I was hoping the giant “Dad” would show his face to really make it an exceptional shot, but it’s pretty good as-is, and does show how many of these guys are roaming around. The hot springs and lake in the background are nice too. 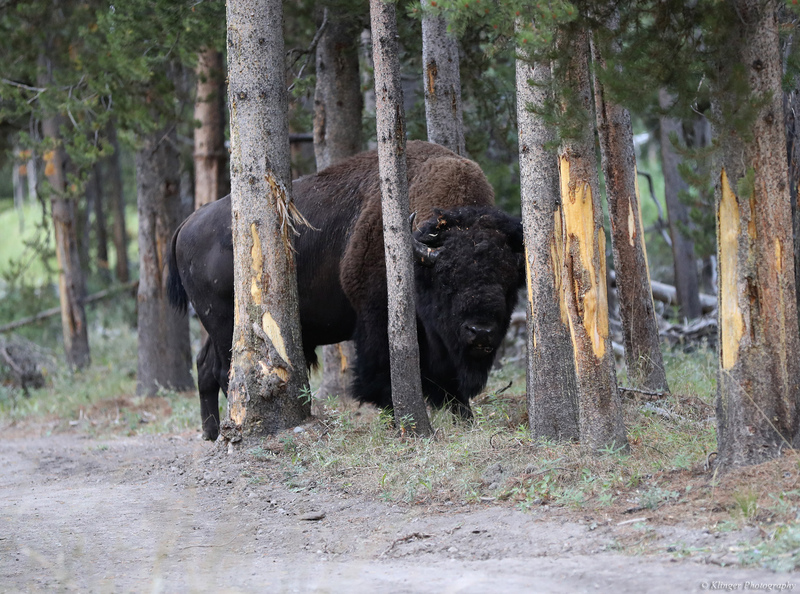 Sticking with buffalo, I’m including the next two pictures, not because they are awesome shots or anything, but they were the very first one we saw – and it was up close! This was at around 7am local time and I was walking out of the hotel to the car to get something and I stop dead in my tracks!! He was probably around 30 feet away, just chillin. Here he is among the trees showing the scars from these guys eating the bark. Notice how this is a nice profile picture, but the lighting isn’t nearly as good on his face, so his eyes don’t pop like in the first picture. 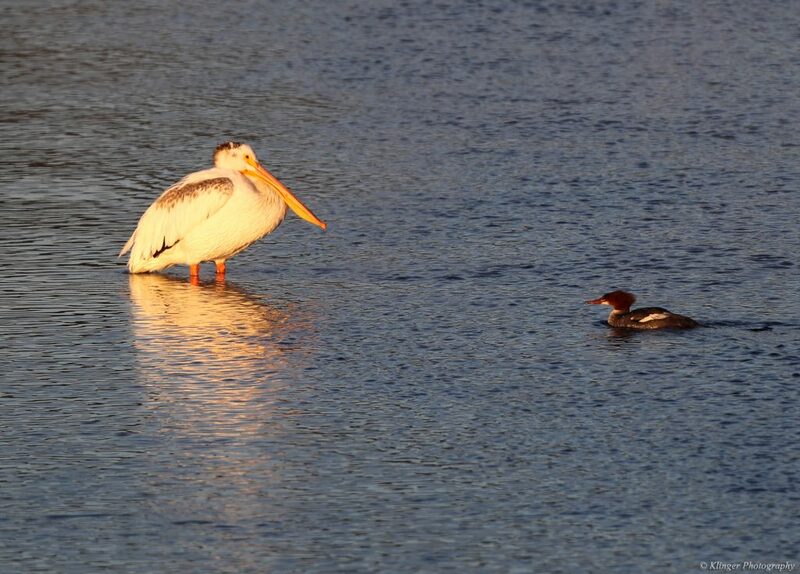 Moving on to other animals, I believe this is an American Pelican. The lighting was great (at 6:41 am local time!). This was taken with a 300mm w/2x teleconverter, so an effective 600mm and a fairly heavy crop. These guys were a long way away, but I think it holds up well quality wise. I believe this is a female pronghorn or American antelope. 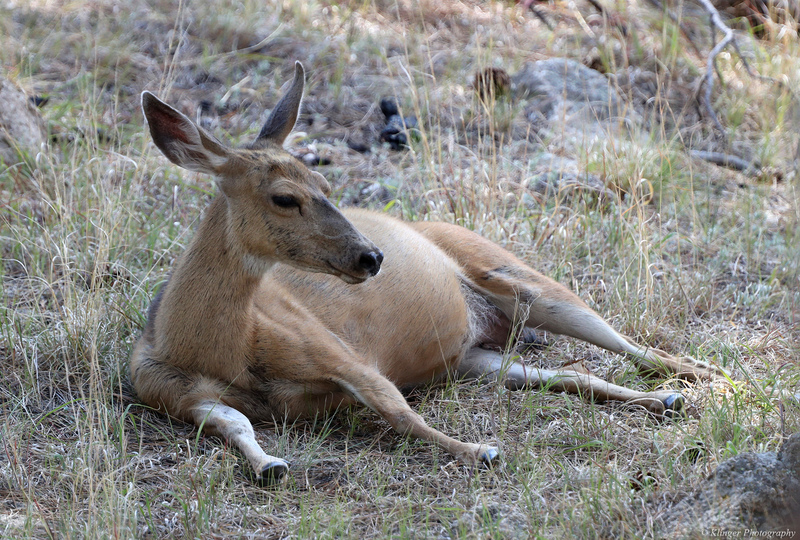 We have plenty of deer all around Michigan, but you don’t usually find them hanging out like this and posing nicely! 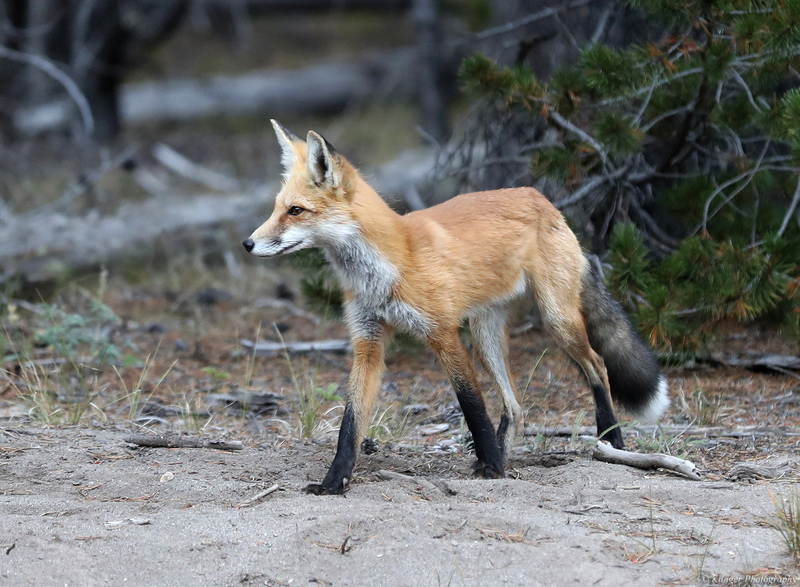 Probably the most rare/difficult wildlife pictures I got were of this wild fox. 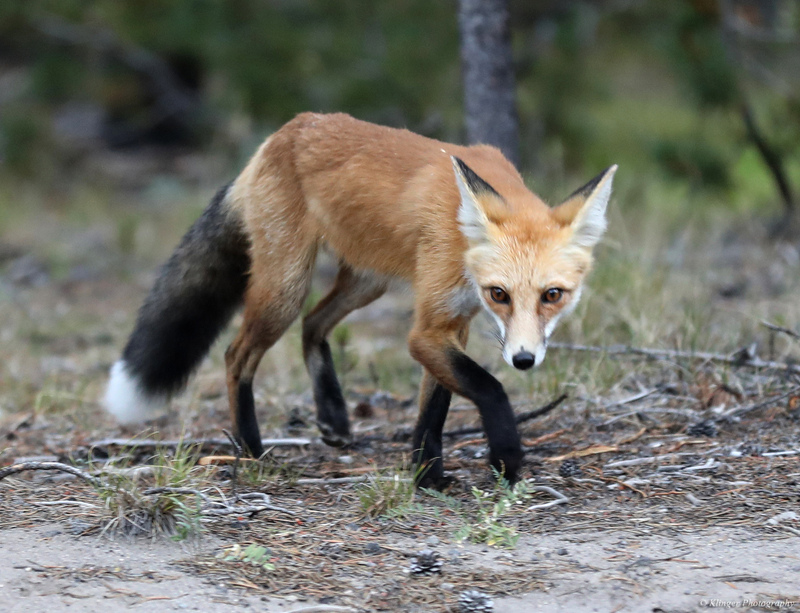 Our photo excursion trip saw this beautiful animal on the side of the road in the woods. Our driver was able to stop the bus to try and get some shots, but there was no time to get out. These pictures were through an open window. Definitely not ideal conditions, but I was lucky enough to be ready (and on the correct side of the bus) to snap a couple great shots. 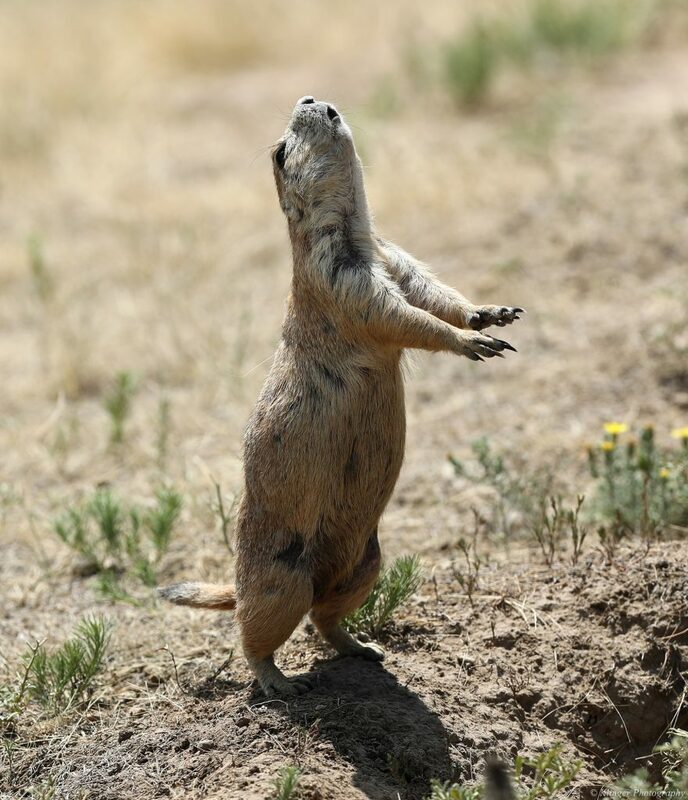 I really love these final two shots of a prairie dog. 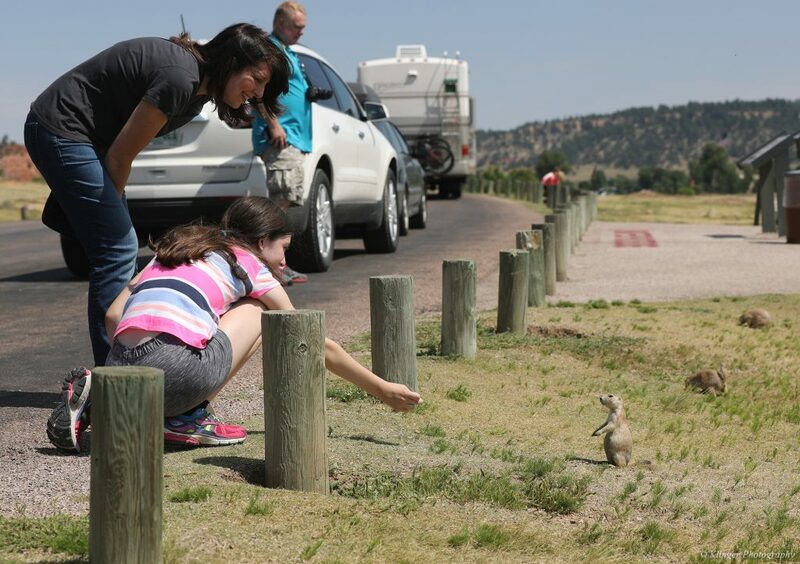 There was a huge field of them around Devils Tower. You can see one coming up to Anna in the “Vicki and Anna (part 1)” post. 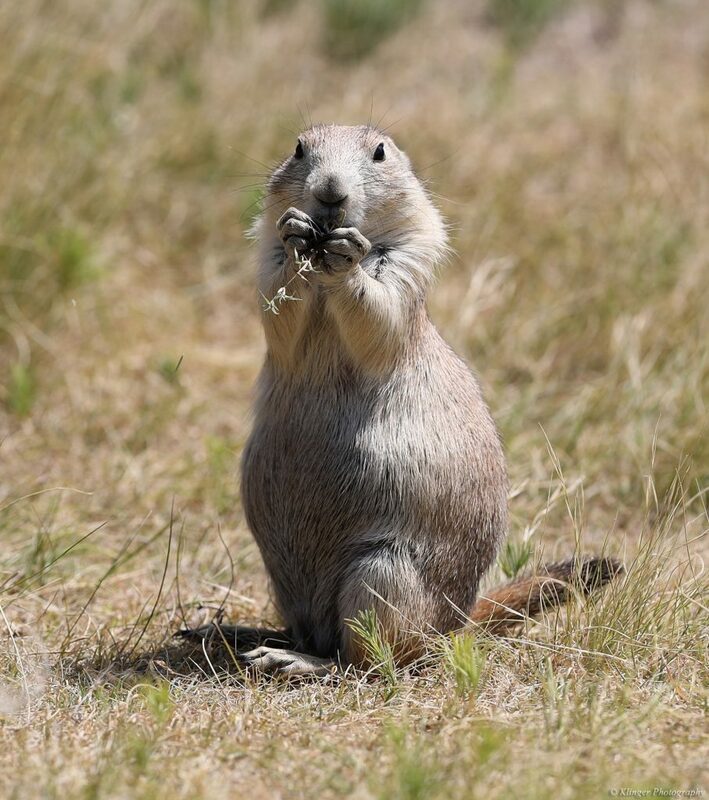 The first picture is the little guy being super cute eating some grass. I was lucky enough to get this one howling, or doing some sort of mating call. It was pretty neat to see, and hear, in person. It happens really fast, so I was pretty lucky to get it. As a nice bonus, both of these picture were taken with the incredible Canon 300mm f2.8 IS lens (which I borrowed for this trip), so the quality is exceptional. 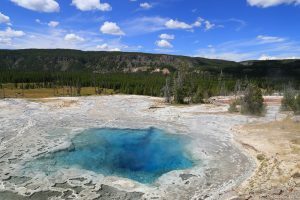 I hope you enjoyed seeing my favorite pictures, and reading about some of our adventures during our road trip to Yellowstone. 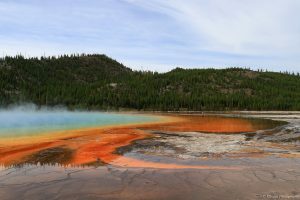 If you’ve never been there, I can highly recommend it! Please feel free to leave comments, and subscribe to the blog if you’d like to be notified when I create new posts. Here are some pictures of my two favorite girls during our road trip. Part one covers the first few days as we were driving to Yellowstone, and part two will cover the pictures of them at the park. 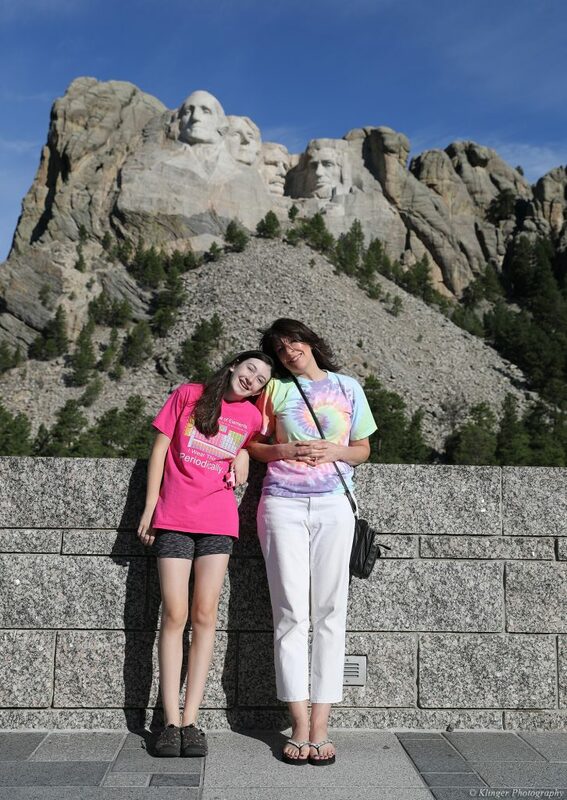 The second leg our our journey (after Mall of America – sorry, no pics), took us to Mount Rushmore in South Dakota. I had never been there before, so it was a new experience for me. 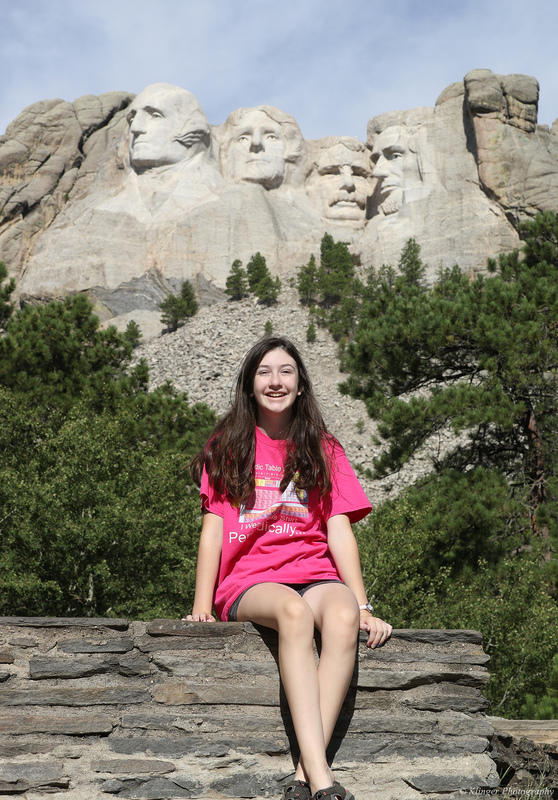 I definitely enjoyed it, and walking around learning about how it was constructed was pretty cool. 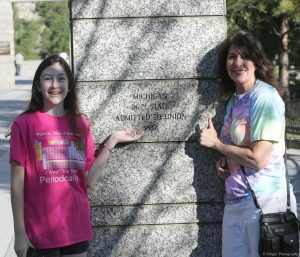 The entrance has pillars and flags for very state, so we had to get a picture by the Michigan one. Getting a pic from the observation deck was a requirement. The key is to get there early, by the time we left a couple hours later, there were TONS of people around and it becomes much harder to get “clean” pictures. 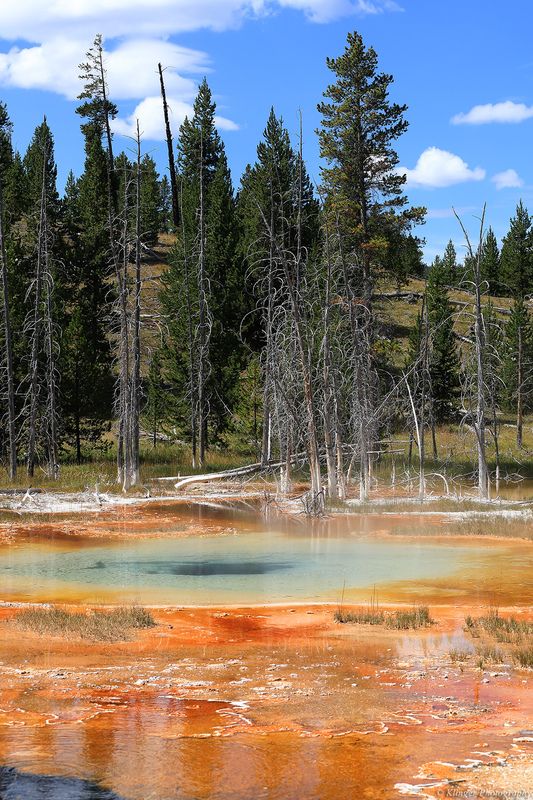 Of course, that could be said of every place at Yellowstone too. One thing that worked in our favor was basically staying on Eastern time. We’d be two hours earlier than many people without even trying. This one is from our quick hike around monument area. 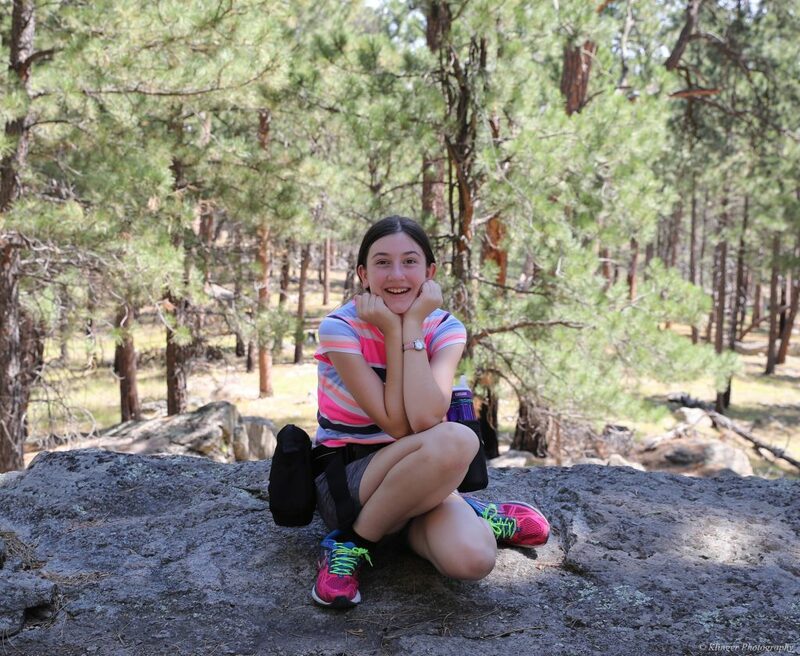 I really like this one from our night in the cabin we stayed at near Mount Rushmore. 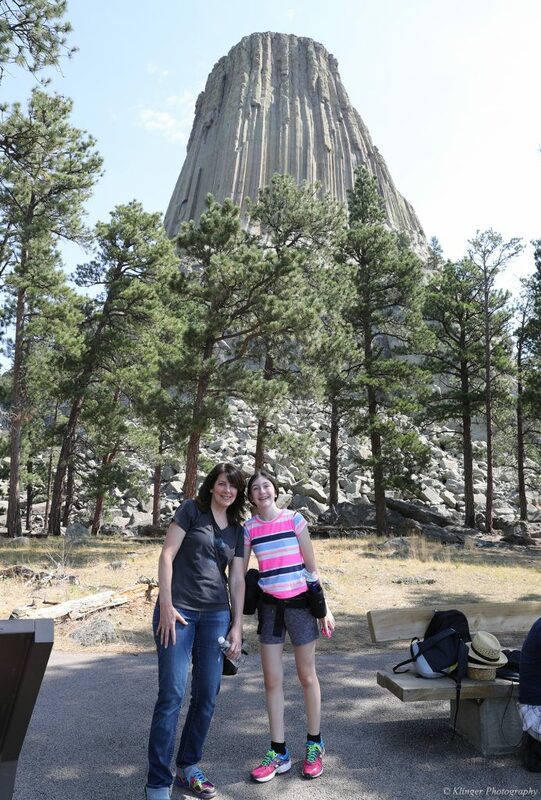 Next up was Devils Tower National Monument in Wyoming. I really enjoyed checking the tower out, as it has been on my bucket list for a long time. It was famously used as an alien landing pad in the movie Close Encounters of the Third Kind. 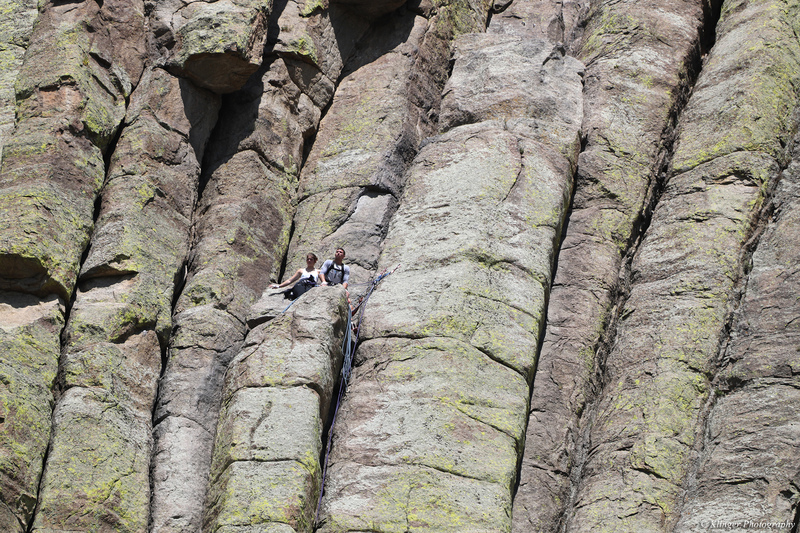 It is well worth the effort to take the fairly easy hike around the tower to see everything up close. 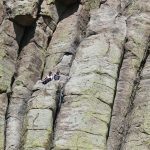 We even saw a couple climbing it!! 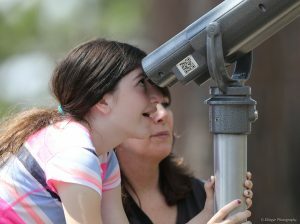 That picture was taken with a 300mm f2.8 lens with a 2x teleconverter for an effective 600mm focal length. They were a LONG way away! These next two were taken around the back side of the tower during the hike. Here is Anna trying to entice a prairie dog to come a little closer with a piece of grass. It’s not food, don’t worry. No feeding the animals!! In a future post, I’ll have one dedicated to all the cool wildlife I was able to get good pictures of, and we’ll see these guys in more detail. The final picture for this post is from one of the many side-of-the-road stopping points. 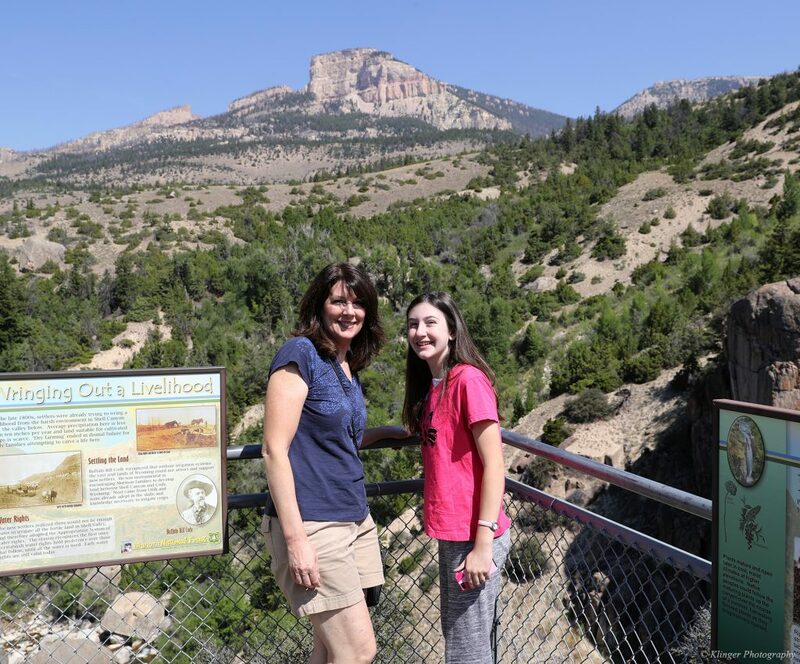 According to the sign, it’s part of the Bighorn National Forest. Be sure to check out part two for our dynamic duo in Yellowstone! These are some of my favorite pictures from the entire trip. 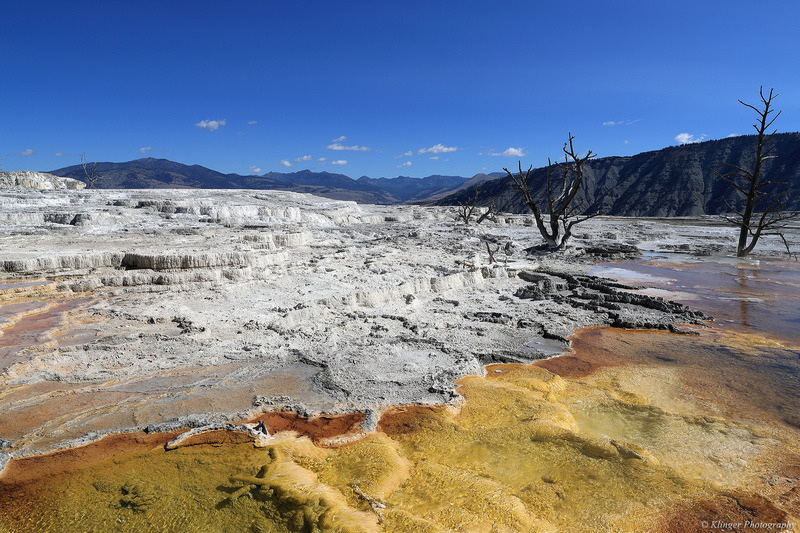 The hot springs and thermal features of Yellowstone are incredible. 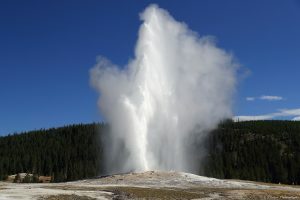 The most famous geyser of all, Old Faithful. This particular shot was one of about 150 I took of a single eruption sequence. 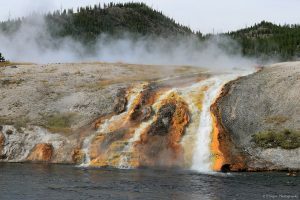 I thought this one best captured the peak point of the eruption, and had a lot of nice detail in the water and steam. If you hiked the marked trail/decking at Old Faithful, and then continued on, you will come upon this next scene. I really like this picture as it shows the full range of colors in the park. 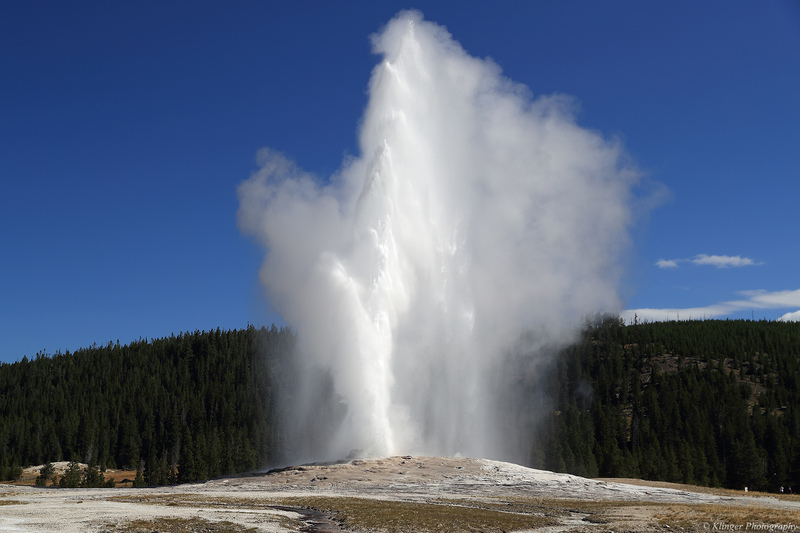 The number of people here, compared to around Old Faithful itself, was drastically reduced. As soon as any amount of effort was required to go somewhere, the herd was thinned. That was nice. Just a bit further up the hiking trail, you come to this incredible hot spring. It would have been nicer to be able to get this from a slightly higher angle, but unfortunately, there were no ladders around. Hiking quite a bit further up the trail was this amazing scene. It is one of my all time favorite pictures from the trip. The picture, while pretty impressive, doesn’t do the actual scene complete justice. 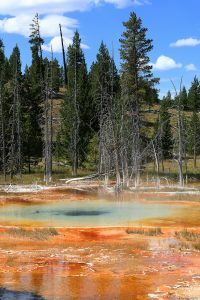 The previous pictures were all in the Old Faithful general area of Yellowstone. That day, we hiked over 12 miles! It was quite tiring, but it was very much worthwhile. 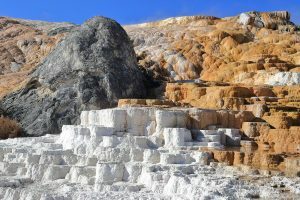 The next set of pictures come from the Mammoth Hot Springs area. If you recall from the map in part 1, it’s in the upper west area of the park. These next few pictures might be the most “other-worldly” of all. This does not look like planet Earth! In a slightly different area of Mammoth Hot Springs, there is mixed scenery like this next picture. 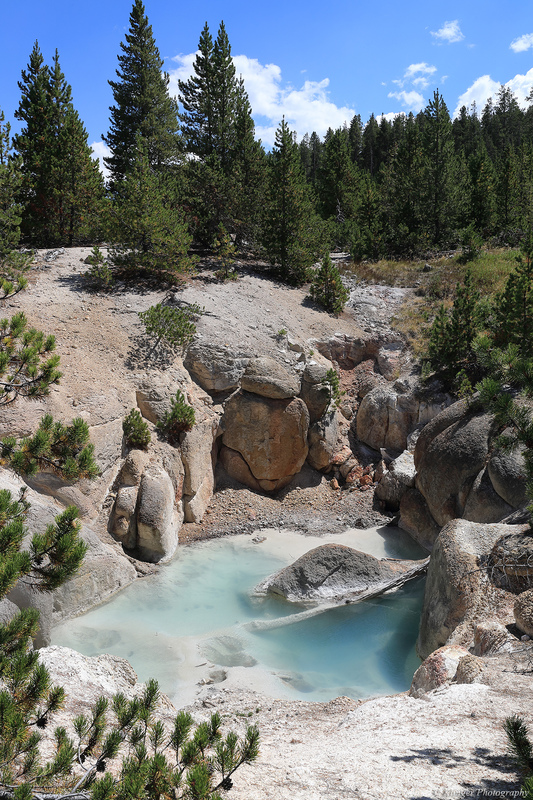 Milky light blue, along with pine forest. Very cool! Next up is what is probably the second most famous thing at Yellowstone, the Grand Prismatic Spring. 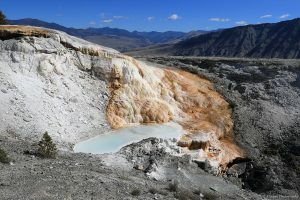 The best pictures of this hot spring come from much higher elevations, so you can see the entire thing at once, but my only access that day was from along its “shore”. 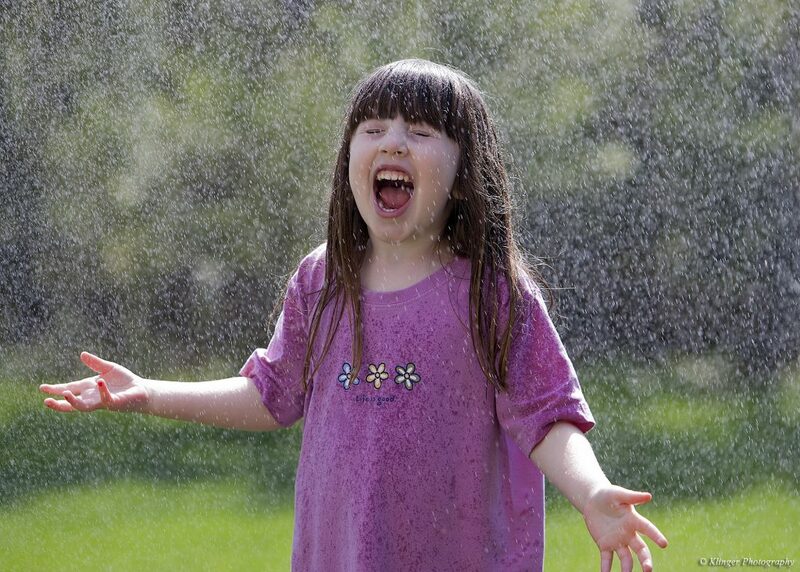 This picture represents between a third and a half of the entire spring. What is really neat, is that this next picture really does belong directly below. 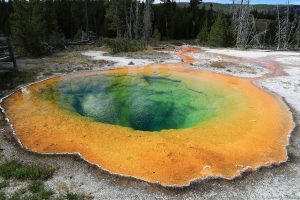 It is the runoff from the Grand Prismatic Spring. According to Wikipedia, this spring discharges about 560 gallons of 160 deg F water per minute!